Stiasny, M. H. , Sswat, M. , Mittermayer, F. H. , Falk-Petersen, I. B., Schnell, N. K., Puvanendran, V., Mortensen, A., Reusch, T. B. H. und Clemmesen, C. (2019) Divergent responses of Atlantic cod to ocean acidification and food limitation. Global Change Biology, 25 (3). pp. 839-849. DOI 10.1111/gcb.14554. Algueró-Muñiz, M., Horn, H. G., Alvarez-Fernandez, S., Spisla, C., Aberle, N., Bach, L. T. , Guan, W., Achterberg, E. P. , Riebesell, U. und Boersma, M. (2019) Analyzing the Impacts of Elevated-CO2 Levels on the Development of a Subtropical Zooplankton Community During Oligotrophic Conditions and Simulated Upwelling. Frontiers in Marine Science, 6 (61). DOI 10.3389/fmars.2019.00061. Taubner, I., Hu, M. Y. A. , Eisenhauer, A. und Bleich, M. (2019) Electrophysiological evidence for light-activated cation transport in calcifying corals. Proceedings of the Royal Society B: Biological Sciences, 286 (20182444). DOI 10.1098/rspb.2018.2444. Riebesell, U. , Aberle-Malzahn, N., Achterberg, E. P. , Alguero-Muniz, M., Alvarez-Fernandez, S., Aristegui, J., Bach, L. T. , Boersma, M. , Boxhammer, T., Guan, W., Haunost, M., Horn, H. G., Löscher, C. R., Ludwig, A., Spisla, C., Sswat, M. , Stange, P. und Taucher, J. (2018) Toxic algal bloom induced by ocean acidification disrupts the pelagic food web. Nature Climate Change, 8 (12). pp. 1082-1086. DOI 10.1038/s41558-018-0344-1. Lischka, S. , Stange, P. und Riebesell, U. (2018) Response of pelagic calcifiers (Foraminifera, Thecosomata) to ocean acidification during oligotrophic and simulated up-welling conditions in the subtropical North Atlantic off Gran Canaria. Frontiers in Marine Science, 5 . Art.Nr. 379. DOI 10.3389/fmars.2018.00379 . Taucher, J. , Aristegui, J., Bach, L. T. , Guan, W., Montero, M. F., Nauendorf, A., Achterberg, E. P. und Riebesell, U. (2018) Response of subtropical phytoplankton communities to ocean acidification under oligotrophic conditions and during nutrient fertilization. Frontiers in Marine Science, 5 . Art.Nr. 330. DOI 10.3389/fmars.2018.00330 . Pansch, C. , Scotti, M. , Barboza, F. R. , Al-Janabi, B., Brakel, J., Briski, E. , Buchholz, B., Franz, M. , Ito, M., Paiva, F. , Saha, M. , Sawall, Y., Weinberger, F. und Wahl, M. (2018) Heat waves and their significance for a temperate benthic community: A near-natural experimental approach. Global Change Biology, 24 . pp. 4357-4367. DOI 10.1111/gcb.14282. Filella, A., Baños, I., Montero, M. F., Hernández-Hernández, N., Rodríguez-Santos, A., Ludwig, A., Riebesell, U. und Arístegui, J. (2018) Plankton Community Respiration and ETS Activity Under Variable CO2 and Nutrient Fertilization During a Mesocosm Study in the Subtropical North Atlantic. Frontiers in Marine Science, 5 . Art.Nr. 310. DOI 10.3389/fmars.2018.00310. Archer, S. D., Suffrian, K., Posman, K. M., Bach, L. T. , Matrai, P. A., Countway, P. D., Ludwig, A. und Riebesell, U. (2018) Processes That Contribute to Decreased Dimethyl Sulfide Production in Response to Ocean Acidification in Subtropical Waters. Frontiers in Marine Science, 5 . Art.Nr. 245. DOI 10.3389/fmars.2018.00245. Alvarez-Fernandez, S., Bach, L. T. , Taucher, J. , Riebesell, U. , Sommer, U., Aberle, N., Brussaard, C. P. D. und Boersma, M. (2018) Plankton responses to ocean acidification: The role of nutrient limitation. Progress in Oceanography, 165 . pp. 11-18. DOI 10.1016/j.pocean.2018.04.006. Paul, A. J., Sommer, U., Paul, C. und Riebesell, U. (2018) Baltic Sea diazotrophic cyanobacterium is negatively affected by acidification and warming. Marine Ecology Progress Series, 598 . pp. 49-60. DOI 10.3354/meps12632. Hernández-Hernández, N., Bach, L. T. , Montero, M. F., Taucher, J. , Baños, I., Guan, W., Esposito, M., Ludwig, A., Achterberg, E. P. , Riebesell, U. und Arístegui, J. (2018) High CO2 Under Nutrient Fertilization Increases Primary Production and Biomass in Subtropical Phytoplankton Communities: A Mesocosm Approach. Frontiers in Marine Science, 5 . Art.Nr. 213. DOI 10.3389/fmars.2018.00213. Zhang, Y., Bach, L. T. , Lohbeck, K. T., Schulz, K. G., Listmann, L. , Klapper, R. und Riebesell, U. (2018) Population-specific responses in physiological rates of Emiliania huxleyi to a broad CO2 range. Biogeosciences (BG), 15 . pp. 3691-3701. DOI 10.5194/bg-15-3691-2018. Taucher, J. , Stange, P., Alguero-Muniz, M., Bach, L. T. , Nauendorf, A., Kolzenburg, R., Büdenbender, J. und Riebesell, U. (2018) In situ camera observations reveal major role of zooplankton in modulating marine snow formation during an upwelling-induced plankton bloom. Progress in Oceanography, 164 . pp. 75-88. DOI 10.1016/j.pocean.2018.01.004. Sett, S., Schulz, K. G., Bach, L. T. und Riebesell, U. (2018) Shift towards larger diatoms in a natural phytoplankton assemblage under combined high-CO2 and warming conditions. Journal of Plankton Research, 40 (4). pp. 391-406. DOI 10.1093/plankt/fby018. Stiasny, M. H. , Mittermayer, F. , Göttler, G., Bridges, C. R., Falk-Petersen, I. B., Puvanendran, V., Mortensen, A., Reusch, T. B. H. und Clemmesen, C. (2018) Effects of parental acclimation and energy limitation in response to high CO2 exposure in Atlantic cod. Scientific Reports, 8 . Art.Nr. 8348. DOI 10.1038/s41598-018-26711-y. Boxhammer, T. , Taucher, J. , Bach, L. T. , Achterberg, E. P. , Algueró-Muñiz, M., Bellworthy, J., Czerny, J., Esposito, M., Haunost, M., Hellemann, D., Ludwig, A., Yong, J. C., Zark, M., Riebesell, U. und Anderson, L. G. (2018) Enhanced transfer of organic matter to higher trophic levels caused by ocean acidification and its implications for export production: A mass balance approach. PLoS ONE, 13 (5). e0197502. DOI 10.1371/journal.pone.0197502. Stange, P., Taucher, J. , Bach, L. T. , Algueró-Muñiz, M., Horn, H. G., Krebs, L., Boxhammer, T. , Nauendorf, A. K. und Riebesell, U. (2018) Ocean Acidification-Induced Restructuring of the Plankton Food Web Can Influence the Degradation of Sinking Particles. Frontiers in Marine Science, 5 . Art.Nr. 140. DOI 10.3389/fmars.2018.00140. Bach, L. T. , Lohbeck, K. T., Reusch, T. B. H. und Riebesell, U. (2018) Rapid evolution of highly variable competitive abilities in a key phytoplankton species. Nature Ecology & Evolution, 2 . pp. 611-613. DOI 10.1038/s41559-018-0474-x. Sswat, M. , Stiasny, M. H. , Taucher, J. , Algueró-Muñiz, M., Bach, L. T. , Jutfelt, F., Riebesell, U. und Clemmesen, C. (2018) Food web changes under ocean acidification promote herring larvae survival. Nature Ecology & Evolution, 2 . pp. 836-840. DOI 10.1038/s41559-018-0514-6. Thomsen, J., Ramesh, K., Sanders, T. , Bleich, M. und Melzner, F. (2018) Calcification in a marginal sea - influence of seawater [Ca2+] and carbonate chemistry on bivalve shell formation. Biogeosciences (BG), 15 . pp. 1469-1482. DOI 10.5194/bg-15-1469-2018. Ni, S., Taubner, I., Böhm, F., Winde, V. und Böttcher, M. E. (2018) Effect of temperature rise and ocean acidification on growth of calcifying tubeworm shells (Spirorbis spirorbis): an in situ benthocosm approach. Biogeosciences (BG), 15 (5). pp. 1425-1445. DOI 10.5194/bg-15-1425-2018. Leo, E., Dahlke, F. T., Storch, D., Pörtner, H. O. und Mark, F. C. (2018) Impact of Ocean Acidification and Warming on the bioenergetics of developing eggs of Atlantic herring Clupea harengus. Conservation Physiology, 6 (1). coy050. DOI 10.1093/conphys/coy050. Sswat, M. , Stiasny, M. H. , Jutfelt, F., Riebesell, U. und Clemmesen, C. (2018) Growth performance and survival of larval Atlantic herring, under the combined effects of elevated temperatures and CO2. PLoS ONE, 13 (1). e0191947. DOI 10.1371/journal.pone.0191947. Bach, L. T. , Alvarez-Fernandez, S., Hornick, T., Stuhr, A. und Riebesell, U. (2017) Simulated ocean acidification reveals winners and losers in coastal phytoplankton. PLoS ONE, 12 (11). e0188198. DOI 10.1371/journal.pone.0188198. Almén, A. K., Brutemark, A., Jutfelt, F., Riebesell, U. und Engström-Öst, J. (2017) Ocean acidification causes no detectable effect on swimming activity and body size in a common copepod. Hydrobiologia, 802 (1). pp. 235-243. DOI 10.1007/s10750-017-3273-5. Zark, M., Broda, N. K., Hornick, T., Grossart, H. P., Riebesell, U. und Dittmar, T. (2017) Ocean Acidification Experiments in Large-Scale Mesocosms Reveal Similar Dynamics of Dissolved Organic Matter Production and Biotransformation. Frontiers in Marine Science, 4 . Art.Nr. 271. DOI 10.3389/fmars.2017.00271. Taubner, I., Böhm, F., Eisenhauer, A. , Tambutté, E., Tambutté, S., Moldzio, S. und Bleich, M. (2017) An improved approach investigating epithelial ion transport in scleractinian corals. Limnology and Oceanography: Methods, 15 (9). pp. 753-765. DOI 10.1002/lom3.10194. Crawfurd, K. J., Alvarez-Fernandez, S., Mojica, K. D. A., Riebesell, U. und Brussaard, C. P. D. (2017) Alterations in microbial community composition with increasing fCO2: a mesocosm study in the eastern Baltic Sea. Biogeosciences (BG), 14 (16). pp. 3831-3849. DOI 10.5194/bg-14-3831-2017. Garzke, J., Sommer, U. und Ismar, S. M. H. (2017) Is the chemical composition of biomass the agent by which ocean acidification impacts on zooplankton ecology?. Aquatic Sciences, 79 (3). pp. 733-748. DOI 10.1007/s00027-017-0532-5. Lischka, S. und Riebesell, U. (2017) Metabolic response of Arctic pteropods to ocean acidification and warming during the polar night/twilight phase in Kongsfjord (Spitsbergen). Polar Biology, 40 (6). pp. 1211-1227. DOI 10.1007/s00300-016-2044-5. Graiff, A., Dankworth, M., Wahl, M. , Karsten, U. und Bartsch, I. (2017) Seasonal variations of Fucus vesiculosus fertility under ocean acidification and warming in the western Baltic Sea. Botanica Marina, 60 (3). pp. 239-255. DOI 10.1515/bot-2016-0081. Stapp, L. S., Thomsen, J., Schade, H., Bock, C., Melzner, F., Pörtner, H. O. und Lannig, G. (2017) Intra-population variability of ocean acidification impacts on the physiology of Baltic blue mussels (Mytilus edulis): integrating tissue and organism response. Journal of Comparative Physiology B - Biochemical Systemic and Environmental Physiology, 187 (4). pp. 529-543. DOI 10.1007/s00360-016-1053-6. Büscher, J. V., Form, A. U. und Riebesell, U. (2017) Interactive Effects of Ocean Acidification and Warming on Growth, Fitness and Survival of the Cold-Water Coral Lophelia pertusa under Different Food Availabilities. Frontiers in Marine Science, 4 . Art.Nr. 101. DOI 10.3389/fmars.2017.00101. Langer, J. A. F., Sharma, R., Schmidt, S. I., Bahrdt, S., Horn, H. G., Alguero-Muniz, M., Nam, B., Achterberg, E. P. , Riebesell, U. , Boersma, M., Thines, M. und Schwenk, K. (2017) Community barcoding reveals little effect of ocean acidification on the composition of coastal plankton communities: evidence from a long-term mesocosm study in the Gullmar Fjord, Skagerrak. PLoS ONE, 12 (4). e0175808. DOI 10.1371/journal.pone.0175808. Bellworthy, J., Gledhill, M. , Esposito, M. und Achterberg, E. P. (2017) Abundance of the iron containing biomolecule, heme b, during the progression of a spring phytoplankton bloom in a mesocosm experiment. PLoS ONE, 12 (4). e0176268. DOI 10.1371/journal.pone.0176268. Thomsen, J., Stapp, L. S., Haynert, K., Schade, H., Danelli, M., Lannig, G., Wegner, K. M. und Melzner, F. (2017) Naturally acidified habitat selects for ocean acidification–tolerant mussels. Science Advances, 3 (4). e1602411. DOI 10.1126/sciadv.1602411. Alguero-Muniz, M., Alvarez-Fernandez, S., Thor, P., Bach, L. T. , Esposito, M., Horn, H. G., Ecker, U., Langer, J. A. F., Taucher, J. , Malzahn, A. M., Riebesell, U. und Boersma, M. (2017) Ocean acidification effects on mesozooplankton community development: Results from a long-term mesocosm experiment. PLoS ONE, 12 (4). e0175851. DOI 10.1371/journal.pone.0175851. Krishna, S. und Schartau, M. (2017) A data-model synthesis to explain variability in calcification observed during a CO2 perturbation mesocosm experiment. Biogeosciences (BG), 14 (7). pp. 1857-1882. DOI 10.5194/bg-14-1857-2017. Moreno de Castro, M., Schartau, M. und Wirtz, K. (2017) Potential sources of variability in mesocosm experiments on the response of phytoplankton to ocean acidification. Biogeosciences (BG), 14 (7). pp. 1883-1901. DOI 10.5194/bg-14-1883-2017. Taucher, J. , Bach, L. T. , Boxhammer, T. , Nauendorf, A., Achterberg, E. P. , Algueró-Muñiz, M., Arístegui, J., Czerny, J., Esposito, M., Guan, W., Haunost, M., Horn, H. G., Ludwig, A., Meyer, J., Spisla, C., Sswat, M. , Stange, P. und Riebesell, U. and The Gran Canaria KOSMOS Consortium (2017) Influence of Ocean Acidification and Deep Water Upwelling on Oligotrophic Plankton Communities in the Subtropical North Atlantic: Insights from an In situ Mesocosm Study. Frontiers in Marine Science, 4 . Art.Nr. 85. DOI 10.3389/fmars.2017.00085. Tanhua, T. , Hoppema, M., Jones, E. M., Stöven, T. , Hauck, J., Davila, M. G., Santana-Casiano, M., Alvarez, M. und Strass, V. H. (2017) Temporal changes in ventilation and the carbonate system in the Atlantic sector of the Southern Ocean. Deep Sea Research Part II: Topical Studies in Oceanography, 138 . pp. 26-38. DOI 10.1016/j.dsr2.2016.10.004. Dietze, H. , Getzlaff, J. und Löptien, U. (2017) Simulating natural carbon sequestration in the Southern Ocean: on uncertainties associated with eddy parameterizations and iron deposition. Biogeosciences (BG), 14 . pp. 1561-1576. DOI 10.5194/bg-14-1561-2017. Schulz, K. G., Bach, L. T. , Bellerby, R. G. J., Bermudez, R., Büdenbender, J., Boxhammer, T. , Czerny, J., Engel, A. , Ludwig, A., Meyerhöfer, M., Larsen, A., Paul, A. J., Sswat, M. und Riebesell, U. (2017) Phytoplankton Blooms at Increasing Levels of Atmospheric Carbon Dioxide: Experimental Evidence for Negative Effects on Prymnesiophytes and Positive on Small Picoeukaryotes. Frontiers in Marine Science, 4 . Art.Nr. 64. DOI 10.3389/fmars.2017.00064. Fink, A., den Haan, J., Chennu, A., Uthicke, S. und de Beer, D. (2017) Ocean Acidification Changes Abiotic Processes but Not Biotic Processes in Coral Reef Sediments. Frontiers in Marine Science, 4 (Art. Nr. 73). DOI 10.3389/fmars.2017.00073. Eberlein, T., Wohlrab, S., Rost, B., John, U., Bach, L. T. , Riebesell, U. und Van de Waal, D. B. (2017) Effects of ocean acidification on primary production in a coastal North Sea phytoplankton community. PLoS ONE, 12 (3). e0172594. DOI 10.1371/journal.pone.0172594. Taucher, J. , Haunost, M., Boxhammer, T. , Bach, L. T. , Algueró-Muñiz, M. und Riebesell, U. (2017) Influence of ocean acidification on plankton community structure during a winter-to-summer succession: An imaging approach indicates that copepods can benefit from elevated CO2 via indirect food web effects. PLoS ONE, 12 (2). e0169737. DOI 10.1371/journal.pone.0169737. Raddatz, S., Guy-Haim, T. , Rilov, G. und Wahl, M. (2017) Future warming and acidification effects on anti-fouling and anti-herbivory traits of the brown alga Fucus vesiculosus (Phaeophyceae). Journal of Phycology, 53 (1). pp. 44-58. DOI 10.1111/jpy.12473. Lischka, S. , Bach, L. T. , Schulz, K. G. und Riebesell, U. (2017) Ciliate and mesozooplankton community response to increasing CO2 levels in the Baltic Sea: insights from a large-scale mesocosm experiment. Biogeosciences (BG), 14 . pp. 447-466. DOI 10.5194/bg-14-447-2017. Hrustic, E., Lignell, R., Riebesell, U. und Thingstad, T. F. (2017) Exploring the distance between nitrogen and phosphorus limitation in mesotrophic surface waters using a sensitive bioassay. Biogeosciences (BG), 14 (2). pp. 379-387. DOI 10.5194/bg-14-379-2017. Stange, P., Bach, L. T. , Le Moigne, F. A. C., Taucher, J. , Boxhammer, T. und Riebesell, U. (2017) Quantifying the time lag between organic matter production and export in the surface ocean: Implications for estimates of export efficiency. Geophysical Research Letters, 44 (1). pp. 268-276. DOI 10.1002/2016GL070875. Hornick, T., Bach, L. T. , Crawfurd, K. J., Spilling, K., Achterberg, E. P. , Woodhouse, J. N., Schulz, K. G., Brussaard, C. P. D., Riebesell, U. und Grossart, H. P. (2017) Ocean acidification impacts bacteria–phytoplankton coupling at low-nutrient conditions. Biogeosciences (BG), 14 . pp. 1-15. DOI 10.5194/bg-14-1-2017. Riebesell, U. , Bach, L. T. , Bellerby, R. G. J., Bermudez Monsalve, J. R., Boxhammer, T. , Czerny, J., Larsen, A., Ludwig, A. und Schulz, K. G. (2017) Competitive fitness of a predominant pelagic calcifier impaired by ocean acidification. Nature Geoscience, 10 . pp. 19-23. DOI 10.1038/ngeo2854. Narita, D. und Rehdanz, K. (2017) Economic impact of ocean acidification on shellfish production in Europe. Journal of Environmental Economics and Management, 60 (3). DOI 10.1080/09640568.2016.1162705. Werner, F. J. und Matthiessen, B. (2017) Warming has stronger direct than indirect effects on benthic microalgae in a seaweed system in spring. Marine Biology, 164 (4). Art. No. 67. DOI 10.1007/s00227-017-3109-x. Winde, V., Böttcher, M. E., Voss, M. und Mahler, A. (2017) Bladder wrack (Fucus vesiculosus) as a multi-isotope bio-monitor in an urbanized fjord of the western Baltic Sea. Isotopes in Environmental and Health Studies . pp. 1-17. DOI 10.1080/10256016.2017.1316980. Bermudez, J. R., Winder, M., Stuhr, A., Almen, A. K., Engström-Öst, J. und Riebesell, U. (2016) Effect of ocean acidification on the structure and fatty acid composition of a natural plankton community in the Baltic Sea. Biogeosciences (BG), 13 (24). pp. 6625-6635. DOI 10.5194/bg-13-6625-2016. Bergen, B., Endres, S. , Engel, A. , Zark, M., Dittmar, T., Sommer, U. und Jürgens, K. (2016) Acidification and warming affect prominent bacteria in two seasonal phytoplankton bloom mesocosms. Environmental Microbiology, 18 (12). pp. 4579-4595. DOI 10.1111/1462-2920.13549. Horn, H. G., Sander, N., Stuhr, A., Alguero-Muniz, M., Bach, L. T. , Löder, M. G. J., Boersma, M., Riebesell, U. und Aberle, N. (2016) Low CO2 Sensitivity of Microzooplankton Communities in the Gullmar Fjord, Skagerrak: Evidence from a Long-Term Mesocosm Study. PLoS ONE, 11 (11). e0165800. DOI 10.1371/journal.pone.0165800. Wirtz, K. und Kerimoglu, O. (2016) Autotrophic Stoichiometry Emerging from Optimality and Variable Co-limitation. Frontiers in Marine Science, 4 (Art.No. 131). DOI 10.3389/fevo.2016.00131. Vehmaa, A., Almen, A. K., Brutemark, A., Paul, A. J., Riebesell, U. , Furuhagen, S. und Engström-Öst, J. (2016) Ocean acidification challenges copepod phenotypic plasticity. Biogeosciences (BG), 13 (22). pp. 6171-6182. DOI 10.5194/bg-13-6171-2016. Spilling, K., Schulz, K. G., Paul, A. J., Boxhammer, T. , Achterberg, E. P. , Hornick, T., Lischka, S. , Stuhr, A., Bermudez, R., Czerny, J., Crawfurd, K., Brussaard, C. P. D., Grossart, H. P. und Riebesell, U. (2016) Effects of ocean acidification on pelagic carbon fluxes in a mesocosm experiment. Biogeosciences (BG), 13 . pp. 6081-6093. DOI 10.5194/bg-13-6081-2016. Werner, F. J., Graiff, A. und Matthiessen, B. (2016) Even moderate nutrient enrichment negatively adds up to global climate change effects on a habitat-forming seaweed system. Limnology and Oceanography, 61 (5). pp. 1891-1899. DOI 10.1002/lno.10342. Nasrolahi, A., Havenhand, J., Wrange, A. L. und Pansch, C. (2016) Population and life-stage specific sensitivities to temperature and salinity stress in barnacles. Scientific Reports, 6 . p. 32263. DOI 10.1038/srep32263. Schmidt, G. M., Wall, M., Taylor, M., Jantzen, C. und Richter, C. (2016) Large-amplitude internal waves sustain coral health during thermal stress. Coral Reefs, 35 (3). pp. 869-881. DOI 10.1007/s00338-016-1450-z. Stiasny, M. , Mittermayer, F. , Sswat, M. , Voss, R., Jutfelt, F., Chierici, M., Puvanendran, V., Mortensen, A., Reusch, T. B. H. und Clemmesen, C. (2016) Ocean Acidification Effects on Atlantic Cod Larval Survival and Recruitment to the Fished Population. PLoS ONE, 11 (8). e0155448. DOI 10.1371/journal.pone.0155448. Spilling, K., Paul, A. J., Virkkala, N., Hastings, T., Lischka, S. , Stuhr, A., Bermudez, R., Czerny, J., Boxhammer, T. , Schulz, K. G., Ludwig, A. und Riebesell, U. (2016) Ocean acidification decreases plankton respiration: evidence from a mesocosm experiment. Biogeosciences (BG), 13 . pp. 4707-4719. DOI 10.5194/bg-13-4707-2016. Alguero-Muniz, M., Meunier, C. L., Holst, S., Alvarez-Fernandez, S. und Boersma, M. (2016) Withstanding multiple stressors: ephyrae of the moon jellyfish (Aurelia aurita, Scyphozoa) in a high-temperature, high-CO2 and low-oxygen environment. Marine Biology, 163 (9). DOI 10.1007/s00227-016-2958-z. Bach, L. T. , Taucher, J. , Boxhammer, T. , Ludwig, A., Achterberg, E. P. , Algueró-Muñiz, M., Anderson, L. G., Bellworthy, J., Büdenbender, J., Czerny, J., Ericson, Y., Esposito, M., Fischer, M., Haunost, M., Hellemann, D., Horn, H. G., Hornick, T., Meyer, J., Sswat, M. , Zark, M. und Riebesell, U. and The Kristineberg KOSMOS Consortium (2016) Influence of Ocean Acidification on a Natural Winter-to-Summer Plankton Succession: First Insights from a Long-Term Mesocosm Study Draw Attention to Periods of Low Nutrient Concentrations. PLoS ONE, 11 (8). e0159068. DOI 10.1371/journal.pone.0159068. Webb, A. L., Leedham-Elvidge, E., Hughes, C., Hopkins, F. E., Malin, G., Bach, L. T. , Schulz, K., Crawfurd, K., Brussaard, C. P. D., Stuhr, A., Riebesell, U. und Liss, P. S. (2016) Effect of ocean acidification and elevated fCO2 on trace gas production by a Baltic Sea summer phytoplankton community. Biogeosciences (BG), 13 . pp. 4595-4613. DOI 10.5194/bg-13-4595-2016. Koeve, W. und Kähler, P. (2016) Oxygen utilization rate (OUR) underestimates ocean respiration: A model study. Global Biogeochemical Cycles, 30 (8). pp. 1166-1182. DOI 10.1002/2015GB005354. Thomsen, J., Himmerkus, N., Holland, N., Sartoris, F. J., Bleich, M. und Tresguerres, M. (2016) Ammonia excretion in mytilid mussels is facilitated by ciliary beating. The Journal of Experimental Biology, 219 (15). pp. 2300-2310. DOI 10.1242/jeb.139550. Bach, L. T. , Boxhammer, T. , Larsen, A., Hildebrandt, N., Schulz, K. G. und Riebesell, U. (2016) Influence of plankton community structure on the sinking velocity of marine aggregates. Global Biogeochemical Cycles, 30 (8). pp. 1145-1165. DOI 10.1002/2016GB005372. Monteiro, F. M., Bach, L. T. , Brownlee, C., Bown, P., Rickaby, R. E. M., Poulton, A. J., Tyrrell, T., Beaufort, L., Dutkiewicz, S., Gibbs, S., Gutowska, M. A., Lee, R., Riebesell, U. , Young, J. und Ridgwell, A. (2016) Why marine phytoplankton calcify. Science Advances, 2 (7). e1501822-e1501822. DOI 10.1126/sciadv.1501822. Schlüter, L., Lohbeck, K. T., Gröger, J. P., Riebesell, U. und Reusch, T. B. (2016) Long-term dynamics of adaptive evolution in a globally important phytoplankton species to ocean acidification. Science Advances, 2 (7). e1501660-e1501660. DOI 10.1126/sciadv.1501660. Paul, A. J., Achterberg, E. P. , Bach, L. T. , Boxhammer, T. , Czerny, J., Haunost, M., Schulz, K. G., Stuhr, A. und Riebesell, U. (2016) No observed effect of ocean acidification on nitrogen biogeochemistry in a summer Baltic Sea plankton community. Biogeosciences (BG), 13 . pp. 3901-3913. DOI 10.5194/bg-13-3901-2016. Moustaka-Gouni, M., Kormas, K. A., Scotti, M. , Vardaka, E. und Sommer, U. (2016) Warming and Acidification Effects on Planktonic Heterotrophic Pico- and Nanoflagellates in a Mesocosm Experiment. Protist, 167 (4). pp. 389-410. DOI 10.1016/j.protis.2016.06.004. Bermudez, J. R., Riebesell, U. , Larsen, A. und Winder, M. (2016) Ocean acidification reduces transfer of essential biomolecules in a natural plankton community. Scientific Reports, 6 . p. 27749. DOI 10.1038/srep27749. Koenigstein, S., Ruth, M. und Gößling-Reisemann, S. (2016) Stakeholder-Informed Ecosystem Modeling of Ocean Warming and Acidification Impacts in the Barents Sea Region. Frontiers in Marine Science, 3 . article No. 93. DOI 10.3389/fmars.2016.00093. Jansson, A., Lischka, S. , Boxhammer, T. , Schulz, K. G. und Norkko, J. (2016) Survival and settling of larval Macoma balthica in a large-scale mesocosm experiment at different fCO2 levels. Biogeosciences (BG), 12 (24). pp. 20411-20435. DOI 10.5194/bg-13-3377-2016. Hu, M. Y. A., Michael, K., Kreiss, C. M., Stumpp, M., Dupont, S., Tseng, Y. C. und Lucassen, M. (2016) Temperature Modulates the Effects of Ocean Acidification on Intestinal Ion Transport in Atlantic Cod, Gadus morhua. Frontiers in Physiology, 7 (Art. Nr. 198). DOI 10.3389/fphys.2016.00198. Hüning, A. K., Lange, S., Ramesh, K., Jacob, D. E., Jackson, D. J., Panknin, U., Gutowska, M. A., Philipp, E. E. R., Rosenstiel, P., Lucassen, M. und Melzner, F. (2016) A shell regeneration assay to identify biomineralization candidate genes in mytilid mussels. Marine Genomics, 27 . pp. 57-67. DOI 10.1016/j.margen.2016.03.011. Garzke, J., Hansen, T., Ismar, S. M. H. und Sommer, U. (2016) Combined Effects of Ocean Warming and Acidification on Copepod Abundance, Body Size and Fatty Acid Content. PLoS ONE, 11 (5). e0155952. DOI 10.1371/journal.pone.0155952. Nausch, M., Bach, L. T. , Czerny, J., Goldstein, J., Grossart, H. P., Hellemann, D., Hornick, T., Achterberg, E. P. , Schulz, K. G. und Riebesell, U. (2016) Effects of CO2 perturbation on phosphorus pool sizes and uptake in a mesocosm experiment during a low productive summer season in the northern Baltic Sea. Biogeosciences (BG), 13 (10). pp. 3035-3050. DOI 10.5194/bg-13-3035-2016. Boxhammer, T. , Bach, L. T. , Czerny, J. und Riebesell, U. (2016) Technical Note: Sampling and processing of mesocosm sediment trap material for quantitative biogeochemical analysis. Biogeosciences (BG), 13 (9). pp. 2849-2858. DOI 10.5194/bg-13-2849-2016. Paul, C., Sommer, U., Garzke, J., Moustaka-Gouni, M., Paul, A. J. und Matthiessen, B. (2016) Effects of increased CO2 concentration on nutrient limited coastal summer plankton depend on temperature. Limnology and Oceanography, 61 (3). pp. 853-868. DOI 10.1002/lno.10256. Al-Janabi, B., Kruse, I., Graiff, A., Winde, V., Lenz, M. und Wahl, M. (2016) Buffering and Amplifying Interactions among OAW (Ocean Acidification & Warming) and Nutrient Enrichment on Early Life-Stage Fucus vesiculosus L. (Phaeophyceae) and Their Carry Over Effects to Hypoxia Impact. PLoS ONE, 11 (4). e0152948. DOI 10.1371/journal.pone.0152948. Pansch, A., Winde, V., Asmus, R. und Asmus, H. (2016) Tidal benthic mesocosms simulating future climate change scenarios in the field of marine ecology. Limnology and Oceanography: Methods, 14 (4). pp. 257-267. DOI 10.1002/lom3.10086. Mensch, B., Neulinger, S. C., Graiff, A., Pansch, A., Künzel, S., Fischer, M. A. und Schmitz-Streit, R. (2016) Restructuring of Epibacterial Communities on Fucus vesiculosus forma mytili in Response to Elevated pCO2 and Increased Temperature Levels. Frontiers in Microbiology, 7 . Art.No. : 434. DOI 10.3389/fmicb.2016.00434. Kunz, K. L., Frickenhaus, S., Hardenberg, S., Johansen, T., Leo, E., Pörtner, H. O., Schmidt, M., Windisch, H. S., Knust, R. und Mark, F. C. (2016) New encounters in Arctic waters: a comparison of metabolism and performance of polar cod (Boreogadus saida) and Atlantic cod (Gadus morhua) under ocean acidification and warming. Polar Biology . DOI 10.1007/s00300-016-1932-z. Bögner, D. (2016) Life under Climate Change Scenarios: Sea Urchins’ Cellular Mechanisms for Reproductive Success. Journal of Marine Science and Engineering, 4 (1). p. 28. DOI 10.3390/jmse4010028. Meunier, C. L., Algueruero-Muniz, M., Horn, H. G., Lange, J. A. F. und Boersma, M. (2016) Direct and indirect effects of near-future pCO2 levels on zooplankton dynamics. Marine and Freshwater Research . DOI 10.1071/MF15296. Koenigstein, S., Mark, F. C., Gößling-Reisemann, S., Reuter, H. und Pörtner, H. O. (2016) Modelling climate change impacts on marine fish populations: process-based integration of ocean warming, acidification and other environmental drivers. Fish and Fisheries . n/a-n/a. DOI 10.1111/faf.12155. Werner, F. J., Graiff, A. und Matthiessen, B. (2016) Temperature effects on seaweed-sustaining top-down control vary with season. Oecologia, 180 (3). pp. 889-901. DOI 10.1007/s00442-015-3489-x. Eberlein, T., Van de Waal, D. B., Brandenburg, K. M., John, U., Voss, M., Achterberg, E. P. und Rost, B. (2016) Interactive effects of ocean acidification and nitrogen limitation on two bloom-forming dinoflagellate species. Marine Ecology Progress Series, 543 . pp. 127-140. DOI 10.3354/meps11568. Hildebrandt, N., Sartoris, F. J., Schulz, K. G., Riebesell, U. und Niehoff, B. (2016) Ocean acidification does not alter grazing in the calanoid copepods Calanus finmarchicus and Calanus glacialis. ICES Journal of Marine Science, 73 (3). pp. 927-936. DOI 10.1093/icesjms/fsv226. Horn, H. G., Boersma, M., Garzke, J., Löder, M. G. J., Sommer, U. und Aberle, N. (2016) Effects of high CO2 and warming on a Baltic Sea microzooplankton community. ICES Journal of Marine Science, 73 (3). pp. 772-782. DOI 10.1093/icesjms/fsv198. Ragazzola, F., Foster, L. C., Jones, C. J., Scott, T. B., Fietzke, J. , Kilburn, M. R. und Schmidt, D. N. (2016) Impact of high CO2 on the geochemistry of the coralline algae Lithothamnion glaciale. Scientific Reports, 6 (20572). DOI 10.1038/srep20572. Sigwart, J. D., Lyons, G., Fink, A., Gutowska, M. A., Murray, D., Melzner, F., Houghton, J. D. R. und Hu, M. Y. a. (2016) ElevatedpCO2drives lower growth and yet increased calcification in the early life history of the cuttlefish Sepia officinalis (Mollusca: Cephalopoda). ICES Journal of Marine Science, 73 (3). pp. 970-980. DOI 10.1093/icesjms/fsv188. Quaas, M., Reusch, T. B. H. , Schmidt, J., Tahvonen, O. und Voss, R. (2016) It is the economy, stupid! Projecting the fate of fish populations using ecological-economic modeling. Global Change Biology, 22 (1). pp. 264-270. DOI 10.1111/gcb.13060. Al-Janabi, B., Kruse, I., Graiff, A., Karsten, U. und Wahl, M. (2016) Genotypic variation in tolerance to warming and acidification of early life-stage Fucus vesiculosus L. (Phaeophyceae) in a seasonally fluctuating environment. Marine Biology, 163 (14). pp. 1-15. DOI 10.1007/s00227-015-2804-8. Almen, A. K., Vehmaa, A., Brutemark, A., Bach, L. T. , Lischka, S. , Stuhr, A., Furuhagen, S., Paul, A. J., Bermudez, R., Riebesell, U. und Engström-Öst, J. (2016) Negligible effects of ocean acidification on Eurytemora affinis (Copepoda) offspring production. Biogeosciences (BG), 13 (4). pp. 1037-1048. DOI 10.5194/bg-13-1037-2016. Burt, W. J., Thomas, H., Hagens, M., Pätsch, J., Clargo, N. M., Salt, L. A., Winde, V. und Böttcher, M. E. (2016) Carbon sources in the North Sea evaluated by means of radium and stable carbon isotope tracers. Limnology and Oceanography, 61 (2). pp. 666-683. DOI 10.1002/lno.10243. Hassenrück, C., Fink, A., Lichtschlag, A., Tegetmeyer, H. E., de Beer, D., Ramette, A. und King, G. (2016) Quantification of the effects of ocean acidification on sediment microbial communities in the environment: the importance of ecosystem approaches. FEMS Microbiology Ecology, 92 (5). fiw027. DOI 10.1093/femsec/fiw027. Hassenrück, C., Tegetmeyer, H. E., Ramette, A. und Fabricius, K. (Im Druck / Accepted) Minor impacts of reduced pH on bacterial biofilms on settlement tiles along natural pH gradients at two CO2 seeps in Papua New Guinea. ICES Journal of Marine Science . DOI 10.1093/icesjms/fsw204. Knapp, J. L., Bridges, C. R., Krohn, J., Hoffman, L. C. und Auerswald, L. (2016) The effects of hypercapnia on the West Coast rock lobster (Jasus lalandii) through acute exposure to decreased seawater pH — Physiological and biochemical responses. Journal of Experimental Marine Biology and Ecology, 476 . pp. 58-64. DOI 10.1016/j.jembe.2015.12.001. Pondorfer, A., Barsbai, T. und Schmidt, U. (2016) Gender differences in risk preferences and stereotypes: Experimental evidence from a matrilineal and a patrilineal society. Management Science . Smith, J. N., De’ath, G., Richter, C., Cornils, A., Hall-Spencer, J. M. und Fabricius, K. E. (2016) Ocean acidification reduces demersal zooplankton that reside in tropical coral reefs. Nature Climate Change . DOI 10.1038/NCLIMATE3122. Graiff, A., Bartsch, I., Ruth, W., Wahl, M. und Karsten, K. (2015) Season exerts differential effects of ocean acidification and warming on growth and carbon metabolism of the seaweed Fucus vesiculosus in the western Baltic Sea. Frontiers in Marine Science, 2 (112). DOI 10.3389/fmars.2015.00112. Wall, M., Ragazzola, F., Foster, L. C., Form, A. U. und Schmidt, D. N. (2015) pH up-regulation as a potential mechanism for the cold-water coral Lophelia pertusa to sustain growth in aragonite undersaturated conditions. Biogeosciences (BG), 12 (23). pp. 6869-6880. DOI 10.5194/bg-12-6869-2015. Wahl, M. , Buchholz, B., Winde, V., Golomb, D., Guy-Haim, T. , Müller, J., Rilov, G., Scotti, M. und Boettcher, M. (2015) A mesocosm concept for the simulation of near-natural shallow underwater climates: The Kiel Outdoor Benthocosms (KOB). Limnology and Oceanography: Methods, 13 (11). pp. 651-663. DOI 10.1002/lom3.10055. Paul, A. J., Bach, L. T. , Schulz, K. G., Boxhammer, T. , Czerny, J., Achterberg, E. P. , Hellemann, D., Trense, Y., Nausch, M., Sswat, M. und Riebesell, U. (2015) Effect of elevated CO2 on organic matter pools and fluxes in a summer Baltic Sea plankton community. Biogeosciences (BG), 12 (20). pp. 6181-6203. DOI 10.5194/bg-12-6181-2015. Zhang, Y., Bach, L. T. , Schulz, K. G. und Riebesell, U. (2015) The modulating effect of light intensity on the response of the coccolithophore Gephyrocapsa oceanicato ocean acidification. Limnology and Oceanography, 60 (6). pp. 2145-2157. DOI 10.1002/lno.10161. Basse, W. C., Gutowska, M. A., Findeisen, U., Stumpp, M., Dupont, S., Jackson, D. J., Himmerkus, N., Melzner, F. und Bleich, M. (2015) A sea urchin Na+K+2Cl− cotransporter is involved in the maintenance of calcification-relevant cytoplasmic cords in Strongylocentrotus droebachiensis larvae. Comparative Biochemistry and Physiology A - Molecular and Integrative Physiology, 187 . pp. 184-192. DOI 10.1016/j.cbpa.2015.05.005. Larsen, T., Bach, L. T. , Salvatteci, R., Wang, Y. V., Andersen, N., Ventura, M. und McCarthy, M. D. (2015) Assessing the potential of amino acid 13 patterns as a carbon source tracer in marine sediments: effects of algal growth conditions and sedimentary diagenesis. Biogeosciences (BG), 12 (16). pp. 4979-4992. DOI 10.5194/bg-12-4979-2015. Thomsen, J., Haynert, K., Wegner, K. M. und Melzner, F. (2015) Impact of seawater carbonate chemistry on the calcification of marine bivalves. Biogeosciences (BG), 12 (2). pp. 1543-1571. DOI 10.5194/bg-12-4209-2015. Lesniowski, T. J., Gambill, M., Holst, S., Peck, M. A., Algueró-Muñiz, M., Haunost, M., Malzahn, A. M. und Boersma, M. (2015) Effects of food and CO2 on growth dynamics of polyps of two scyphozoan species (Cyanea capillata and Chrysaora hysoscella). Marine Biology, 162 (6). pp. 1371-1382. DOI 10.1007/s00227-015-2660-6. Bach, L. T. , Riebesell, U. , Gutowska, M. A., Federwisch, L. und Schulz, K. G. (2015) A unifying concept of coccolithophore sensitivity to changing carbonate chemistry embedded in an ecological framework. Progress in Oceanography, 135 . pp. 125-138. DOI 10.1016/j.pocean.2015.04.012. Hassenrück, C., Hofmann, L. C., Bischof, K. und Ramette, A. (2015) Seagrass biofilm communities at a naturally CO2-rich vent. Environmental Microbiology Reports, 7 (3). pp. 516-525. DOI 10.1111/1758-2229.12282. Paul, C., Matthiessen, B. und Sommer, U. (2015) Warming, but not enhanced CO2 concentration, quantitatively and qualitatively affects phytoplankton biomass. Marine Ecology Progress Series, 528 . pp. 39-51. DOI 10.3354/meps11264. Sommer, U., Paul, C. und Moustaka-Gouni, M. (2015) Warming and Ocean Acidification Effects on Phytoplankton - From Species Shifts to Size Shifts within Species in a Mesocosm Experiment. PLoS ONE, 10 (5). e0125239. DOI 10.1371/journal.pone.0125239. Bermudez, R., Feng, Y., Roleda, M. Y., Tatters, A. O., Hutchins, D. A., Larsen, T., Boyd, P. W., Hurd, C. L., Riebesell, U. und Winder, M. (2015) Long-Term Conditioning to Elevated pCO2 and Warming Influences the Fatty and Amino Acid Composition of the Diatom Cylindrotheca fusiformis. PLoS ONE, 10 (5). e0123945. DOI 10.1371/journal.pone.0123945. Scheinin, M., Riebesell, U. , Rynearson, T. A., Lohbeck, K. T. und Collins, S. (2015) Experimental evolution gone wild. Interface: Journal of the Royal Society, 12 (106). p. 20150056. DOI 10.1098/rsif.2015.0056. Fietzke, J. , Ragazzola, F., Halfar, J., Dietze, H. , Foster, L. C., Hansteen, T. H. , Eisenhauer, A. und Steneck, R. S. (2015) Century-scale trends and seasonality in pH and temperature for shallow zones of the Bering Sea. Proceedings of the National Academy of Sciences of the United States of America (PNAS), 112 (10). pp. 2960-2965. DOI 10.1073/pnas.1419216112. Maneja, R., Frommel, A., Browman, H. I., Geffen, A. J., Folkvord, A., Piatkowski, U. , Durif, C. M. F., Bjelland, R., Skiftesvik, A. B. und Clemmesen, C. (2015) The swimming kinematics and foraging behavior of larval Atlantic herring (Clupea harengus L.) are unaffected by elevated pCO2. Journal of Experimental Marine Biology and Ecology, 466 . pp. 42-48. DOI 10.1016/j.jembe.2015.02.008. Riebesell, U. und Gattuso, J. P. (2015) Lessons learned from ocean acidification research. Nature Climate Change, 5 (1). pp. 12-14. DOI 10.1038/nclimate2456. Wall, M., Putchim, L., Schmidt, G. M., Jantzen, C., Khokiattiwong, S. und Richter, C. (2015) Large-amplitude internal waves benefit corals during thermal stress. Proceedings of the Royal Society B: Biological Sciences, 282 (1799). p. 20140650. DOI 10.1098/rspb.2014.0650. Graiff, A., Liesner, D., Karsten, U. und Bartsch, I. (2015) Temperature tolerance of western Baltic Sea Fucus vesiculosus – growth, photosynthesis and survival. Journal of Experimental Marine Biology and Ecology, 471 . pp. 8-16. DOI 10.1016/j.jembe.2015.05.009. Graiff, A., Ruth, W., Kragl, U. und Karsten, U. (2015) Chemical characterization and quantification of the brown algal storage compound laminarin — A new methodological approach. Journal of Applied Phycology . DOI 10.1007/s10811-015-0563-z. Hofmann, L. C., Bischof, K., Baggini, C., Johnson, A., Koop-Jakobsen, K. und Teichberg, M. (2015) CO2 and inorganic nutrient enrichment affect the performance of a calcifying green alga and its noncalcifying epiphyte. Oecologia, 177 (4). pp. 1157-1169. DOI 10.1007/s00442-015-3242-5. Hofmann, L. C., Fink, A., Bischof, K. und de Beer, D. (2015) Microsensor studies on Padina from a natural CO2 seep: implications of morphology on acclimation to low pH. Journal of Phycology, 51 (6). pp. 1106-1115. DOI 10.1111/jpy.12347. Knapp, J. L., Bridges, C. R., Krohn, J., Hoffman, L. C. und Auerswald, L. (2015) Acid–base balance and changes in haemolymph properties of the South African rock lobsters, Jasus lalandii, a palinurid decapod, during chronic hypercapnia. Biochemical and Biophysical Research Communications, 461 (3). pp. 475-480. DOI 10.1016/j.bbrc.2015.04.025. Raulf, F. F., Fabricius, K., Uthicke, S., de Beer, D., Abed, R. M. M. und Ramette, A. (2015) Changes in microbial communities in coastal sediments along natural CO2gradients at a volcanic vent in Papua New Guinea. Environmental Microbiology, 17 (10). pp. 3678-3691. DOI 10.1111/1462-2920.12729. Schutting, S., Jokic, T., Strobl, M., Borisov, S. M., Beer, D. d. und Klimant, I. (2015) NIR optical carbon dioxide sensors based on highly photostable dihydroxy-aza-BODIPY dyes. Journals of Materials Chemistry C, 3 (21). pp. 5474-5483. DOI 10.1039/C5TC00346F. Spitzer, S., Brinkmann, N., Reimer, A., Ionescu, D., Friedl, T., de Beer, D. und Arp, G. (2015) Effect of VariablepCO2on Ca2+Removal and Potential Calcification of Cyanobacterial Biofilms —An Experimental Microsensor Study. Geomicrobiology Journal, 32 (3-4). pp. 304-315. DOI 10.1080/01490451.2014.885617. Wannicke, N., Frindte, K., Gust, G., Liskow, I., Wacker, A., Meyer, A. und Grossart, H. P. (2015) Measuring bacterial activity and community composition at high hydrostatic pressure using a novel experimental approach: a pilot study. Fems Microbiology Ecology, 91 (5). fiv036-fiv036. DOI 10.1093/femsec/fiv036. Zark, M., Riebesell, U. und Dittmar, T. (2015) Effects of ocean acidification on marine dissolved organic matter are not detectable over the succession of phytoplankton blooms. Science Advances, 1 (9). e1500531-e1500531. DOI 10.1126/sciadv.1500531. Woelfel, J., Schoknecht, A., Schaub, I., Enke, N., Schumann, R. und Karsten, U. (2014) Growth and photosynthesis characteristics of three benthic diatoms from the brackish southern Baltic Sea in relation to varying environmental conditions. Phycologia, 53 (6). pp. 639-651. DOI 10.2216/14-019.1. Schiffer, M., Harms, L., Lucassen, M., Mark, F. C., Pörtner, H. O. und Storch, D. (2014) Temperature tolerance of different larval stages of the spider crab Hyas araneus exposed to elevated seawater PCO2. Frontiers in Zoology, 11 (1). DOI 10.1186/s12983-014-0087-4. Galgani, L., Stolle, C., Endres, S. , Schulz, K. G. und Engel, A. (2014) Effects of ocean acidification on the biogenic composition of the sea-surface microlayer: Results from a mesocosm study. Journal of Geophysical Research: Oceans, 119 (11). pp. 7911-7924. DOI 10.1002/2014JC010188. Harvey, B., Al-Janabi, B., Broszeit, S., Cioffi, R., Kumar, A., Aranguren-Gassis, M., Bailey, A., Green, L., Gsottbauer, C., Hall, E., Lechler, M., Mancuso, F., Pereira, C., Ricevuto, E., Schram, J., Stapp, L., Stenberg, S. und Rosa, L. (2014) Evolution of Marine Organisms under Climate Change at Different Levels of Biological Organisation. Water, 6 (11). pp. 3545-3574. DOI 10.3390/w6113545. Hofmann, L. C. und Bischof, K. (2014) Ocean acidification effects on calcifying macroalgae. Aquatic Biology, 22 . pp. 261-279. DOI 10.3354/ab00581. Hennige, S. J., Morrison, C. L., Form, A. U., Büscher, J., Kamenos, N. A. und Roberts, J. M. (2014) Self-recognition in corals facilitates deep-sea habitat engineering. Scientific Reports, 4 . p. 6782. DOI 10.1038/srep06782. Meier, K. J. S., Berger, C. und Kinkel, H. (2014) Increasing coccolith calcification during CO2 rise of the penultimate deglaciation (Termination II). Marine Micropaleontology, 112 . pp. 1-12. DOI 10.1016/j.marmicro.2014.07.001. Maneja, R., Dineshram, R., Thiyagarajan, V., Skiftesvik, A. B., Frommel, A., Clemmesen, C. , Geffen, A. J. und Browman, H. I. (2014) The proteome of Atlantic herring (Clupea harengus L.) larvae is resistant to elevated pCO2. Marine Pollution Bulletin, 86 (1-2). pp. 154-160. DOI 10.1016/j.marpolbul.2014.07.030. Schlüter, L., Lohbeck, K. T., Gutowska, M. A., Gröger, J. P., Riebesell, U. und Reusch, T. B. H. (2014) Adaptation of a globally important coccolithophore to ocean warming and acidification. Nature Climate Change, 4 (11). pp. 1024-1030. DOI 10.1038/NCLIMATE2379. Zhang, Y., Klapper, R., Lohbeck, K. T., Bach, L. T. , Schulz, K. G., Reusch, T. B. H. und Riebesell, U. (2014) Between- and within-population variations in thermal reaction norms of the coccolithophore Emiliania huxleyi. Limnology and Oceanography, 59 (5). pp. 1570-1580. DOI 10.4319/lo.2014.59.5.1570. Appelhans, Y., Thomsen, J., Opitz, S., Pansch, C. , Melzner, F. und Wahl, M. (2014) Juvenile sea stars exposed to acidification decrease feeding and growth with no acclimation potential. Marine Ecology Progress Series, 509 . pp. 227-239. DOI 10.3354/meps10884. Schade, F. M., Clemmesen, C. und Wegner, K. M. (2014) Within- and transgenerational effects of ocean acidification on life history of marine three-spined stickleback (Gasterosteus aculeatus). Marine Biology, 161 (7). pp. 1667-1676. DOI 10.1007/s00227-014-2450-6. Engel, A. , Cisternas Novoa, C., Wurst, M., Endres, S. , Tang, T., Schartau, M. und Lee, C. (2014) No detectable effect of CO2 on elemental stoichiometry of Emiliania huxleyi in nutrient-limited, acclimated continuous cultures. Marine Ecology Progress Series, 507 . pp. 15-30. DOI 10.3354/meps10824. Frommel, A., Maneja, R., Lowe, D., Pascoe, C. K., Geffen, A. J., Folkvord, A., Piatkowski, U. und Clemmesen, C. (2014) Organ damage in Atlantic herring larvae as a result of ocean acidification. Ecological Applications, 24 (5). pp. 1131-1143. DOI 10.1890/13-0297.1. Endres, S. , Galgani, L., Riebesell, U. , Schulz, K. G. und Engel, A. (2014) Stimulated Bacterial Growth under Elevated p Co2: Results from an Off-Shore Mesocosm Study. PLoS ONE, 9 (6). e99228. DOI 10.1371/journal.pone.0099228. Bögner, D., Bickmeyer, U. und Köhler, A. (2014) CO2-induced fertilization impairment in Strongylocentrotus droebachiensis collected in the Arctic. Helgoland Marine Research, 68 (2). pp. 341-356. DOI 10.1007/s10152-014-0394-3. Engel, A. , Piontek, J., Grossart, H. P., Riebesell, U. , Schulz, K. G. und Sperling, M. (2014) Impact of CO2 enrichment on organic matter dynamics during nutrient induced coastal phytoplankton blooms. Journal of Plankton Research, 36 (3). pp. 641-657. DOI 10.1093/plankt/fbt125. Lohbeck, K. T., Riebesell, U. und Reusch, T. B. H. (2014) Gene expression changes in the coccolithophore Emiliania huxleyi after 500 generations of selection to ocean acidification. Proceedings of the Royal Society B: Biological Sciences, 281 (1786). p. 20140003. DOI 10.1098/rspb.2014.0003. Schutting, S., Klimant, I., de Beer, D. und Borisov, S. M. (2014) New highly fluorescent pH indicator for ratiometric RGB imaging of pCO2. Methods and Applications in Fluorescence, 2 (2). 024001. DOI 10.1088/2050-6120/2/2/024001. Gehringer, M. M. und Wannicke, N. (2014) Climate change and regulation of hepatotoxin production in Cyanobacteria. FEMS Microbiology Ecology, 88 (1). pp. 1-25. DOI 10.1111/1574-6941.12291. de Nooijer, L. J., Hathorne, E. C. , Reichart, G. J., Langer, G. und Bijma, J. (2014) Variability in calcitic Mg/Ca and Sr/Ca ratios in clones of the benthic foraminifer Ammonia tepida. Marine Micropaleontology, 107 . pp. 32-43. DOI 10.1016/j.marmicro.2014.02.002. Hildebrandt, N., Niehoff, B. und Sartoris, F. J. (2014) Long-term effects of elevated CO2 and temperature on the Arctic calanoid copepods Calanus glacialis and C. hyperboreus. Marine Pollution Bulletin, 80 (1-2). pp. 59-70. DOI 10.1016/j.marpolbul.2014.01.050. Pansch, C. , Schaub, I., Havenhand, J. und Wahl, M. (2014) Habitat traits and food availability determine the response of marine invertebrates to ocean acidification. Global Change Biology, 20 (3). pp. 765-777. DOI 10.1111/gcb.12478. Berger, C., Meier, K. J. S., Kinkel, H. und Baumann, K. H. (2014) Changes in calcification of coccoliths under stable atmospheric CO2. Biogeosciences (BG), 11 (4). pp. 929-944. DOI 10.5194/bg-11-929-2014. Sunday, J. M., Calosi, P., Dupont, S., Munday, P. L., Stillman, J. H. und Reusch, T. B. H. (2014) Evolution in an acidifying ocean. Trends in Ecology and Evolution, 29 (2). pp. 117-125. DOI 10.1016/j.tree.2013.11.001. Mammitzsch, K., Jost, G. und Jürgens, K. (2014) Impact of dissolved inorganic carbon concentrations and pH on growth of the chemolithoautotrophic epsilonproteobacterium Sulfurimonas gotlandica GD1T. MicrobiologyOpen, 3 (1). pp. 80-88. DOI 10.1002/mbo3.153. Hofmann, L. C., Heiden, J., Bischof, K. und Teichberg, M. (2014) Nutrient availability affects the response of the calcifying chlorophyte Halimeda opuntia (L.) J.V. Lamouroux to low pH. Planta, 239 (1). pp. 231-242. DOI 10.1007/s00425-013-1982-1. Winde, V., Böttcher, M. E., Escher, P., Böning, P., Beck, M., Liebezeit, G. und Schneider, B. (2014) Tidal and spatial variations of DI13C and aquatic chemistry in a temperate tidal basin during winter time. Journal of Marine Systems, 129 . pp. 396-404. DOI 10.1016/j.jmarsys.2013.08.005. Harms, L., Frickenhaus, S., Schiffer, M., Mark, F., Storch, D., Held, C., Pörtner, H. O. und Lucassen, M. (2014) Gene expression profiling in gills of the great spider crab Hyas araneus in response to ocean acidification and warming. BMC Genomics, 15 (1). p. 789. DOI 10.1186/1471-2164-15-789. Hilmi, N., Allemand, D., Cinar, M., Cooley, S., Hall-Spencer, J., Haraldsson, G., Hattam, C., Jeffree, R., Orr, J., Rehdanz, K., Reynaud, S., Safa, A. und Dupont, S. (2014) Exposure of Mediterranean Countries to Ocean Acidification. Water, 6 (6). pp. 1719-1744. DOI 10.3390/w6061719. Müller, M. N., Lebrato, M., Riebesell, U. , Barcelos e Ramos, J., Schulz, K. G., Blanco-Ameijeiras, S., Sett, S., Eisenhauer, A. und Stoll, H. M. (2014) Influence of temperature and CO2 on the strontium and magnesium composition of coccolithophore calcite. Biogeosciences (BG), 11 . pp. 1065-1075. DOI 10.5194/bg-11-1065-2014. Schiffer, M., Harms, L., Pörtner, H. O., Mark, F. C. und Storch, D. (2014) Pre-hatching seawater pCO2 affects development and survival of zoea stages of Arctic spider crab Hyas araneus. Marine Ecology Progress Series, 501 . pp. 127-139. DOI 10.3354/meps10687. Sett, S., Bach, L. T. , Schulz, K. G., Koch-Klavsen, S., Lebrato, M. und Riebesell, U. (2014) Temperature Modulates Coccolithophorid Sensitivity of Growth, Photosynthesis and Calcification to Increasing Seawater pCO2. PLoS ONE, 9 (2). e88308. DOI 10.1371/journal.pone.0088308. Stemmer, K., Brey, T., Glas, M., Beutler, M., Schalkhausser, B. und de Beer, D. (Im Druck / Accepted) In situ measurements of pH, Ca2+ and DIC dynamics within the extrapallial fluid of the ocean quahog Arctica islandica. Journal of Experimental Marine Biology and Ecology . Krause, E., Wichels, A., Erler, R. und Gerdts, G. (2013) Study on the effects of near-future ocean acidification on marine yeasts: a microcosm approach. Helgoland Marine Research, 67 (4). pp. 607-621. DOI 10.1007/s10152-013-0348-1. Stumpp, M., Hu, M. Y. A., Casties, I., Saborowski, R., Bleich, M., Melzner, F. und Dupont, S. (2013) Digestion in sea urchin larvae impaired under ocean acidification. Nature Climate Change, 3 (12). pp. 1044-1049. DOI 10.1038/nclimate2028. Olischläger, M. und Wiencke, C. (2013) Ocean acidification alleviates low-temperature effects on growth and photosynthesis of the red alga Neosiphonia harveyi (Rhodophyta). Journal of Experimental Botany, 64 (18). pp. 5587-5597. DOI 10.1093/jxb/ert329. Ragazzola, F., Foster, L. C., Form, A. U., Büscher, J., Hansteen, T. H. und Fietzke, J. (2013) Phenotypic plasticity of coralline algae in a High CO2world. Ecology and Evolution, 3 (10). pp. 3436-3446. DOI 10.1002/ece3.723. Rouco-Molina, M., Branson, O., Lebrato, M. und Iglesias-Rodriguez, D. (2013) The effect of nitrate and phosphate availability on Emiliania huxleyi physiology under different CO2 scenarios. Frontiers in Microbiology, 4 (155). DOI 10.3389/fmicb.2013.00155. Bach, L. T. , Mackinder, L., Schulz, K. G., Wheeler, G., Schroeder, D. C., Brownlee, C. und Riebesell, U. (2013) Dissecting the impact of CO2and pH on the mechanisms of photosynthesis and calcification in the coccolithophoreEmiliania huxleyi. New Phytologist, 199 (1). pp. 121-134. DOI 10.1111/nph.12225. Browman, H. I., Van de Waal, D. B., John, U., Ziveri, P., Reichart, G. J., Hoins, M., Sluijs, A. und Rost, B. (2013) Ocean Acidification Reduces Growth and Calcification in a Marine Dinoflagellate. PLoS ONE, 8 (6). e65987. DOI 10.1371/journal.pone.0065987. Czerny, J., Schulz, K. G., Boxhammer, T. , Bellerby, R. G. J., Büdenbender, J., Engel, A. , Krug, S., Ludwig, A., Nachtigall, K., Nondal, G., Niehoff, B., Silyakova, A. und Riebesell, U. (2013) Implications of elevated CO2 on pelagic carbon fluxes in an Arctic mesocosm study – an elemental mass balance approach. Biogeosciences (BG), 10 (5). pp. 3109-3125. DOI 10.5194/bg-10-3109-2013. Czerny, J., Schulz, K. G., Krug, S., Ludwig, A. und Riebesell, U. (2013) Technical Note: The determination of enclosed water volume in large flexible-wall mesocosms "KOSMOS". Biogeosciences (BG), 10 (3). pp. 1937-1941. DOI 10.5194/bg-10-1937-2013. Czerny, J., Schulz, K. G., Ludwig, A. und Riebesell, U. (2013) Technical Note: A simple method for air–sea gas exchange measurements in mesocosms and its application in carbon budgeting. Biogeosciences (BG), 10 (3). pp. 11989-12017. DOI 10.5194/bg-10-1379-2013. Dupont, S., Dorey, N., Stumpp, M., Melzner, F. und Thorndyke, M. (2013) Long-term and trans-life-cycle effects of exposure to ocean acidification in the green sea urchin Strongylocentrotus droebachiensis. Marine Biology, 160 (8). pp. 1835-1843. DOI 10.1007/s00227-012-1921-x. Endres, S. , Unger, J., Wannicke, N., Nausch, M., Voss, M. und Engel, A. (2013) Response of Nodularia spumigena to pCO2 – Part 2: Exudation and extracellular enzyme activities. Biogeosciences (BG), 10 . pp. 567-582. DOI 10.5194/bg-10-567-2013. Engel, A. , Borchard, C., Piontek, J., Schulz, K. G., Riebesell, U. und Bellerby, R. (2013) CO2 increases 14C-primary production in an Arctic plankton community. Biogeosciences (BG), 10 (3). pp. 1291-1308. DOI 10.5194/bg-10-1291-2013. Frommel, A., Schubert, A. S., Piatkowski, U. und Clemmesen, C. (2013) Egg and early larval stages of Baltic cod, Gadus morhua, are robust to high levels of ocean acidification. Marine Biology, 160 (8). pp. 1825-1834. DOI 10.1007/s00227-011-1876-3. Galgani, L. und Engel, A. (2013) Accumulation of Gel Particles in the Sea-Surface Microlayer during an Experimental Study with the Diatom Thalassiosira weissflogii. International Journal of Geosciences, 04 (01). pp. 129-145. DOI 10.4236/ijg.2013.41013. Garrard, S. L., Hunter, R. C., Frommel, A., Lane, A. C., Phillips, J. C., Cooper, R., Dineshram, R., Cardini, U., McCoy, S. J., Arnberg, M., Rodrigues Alves, B. G., Annane, S., Orte, M. R., Kumar, A., Aguirre-Martínez, G. V., Maneja, R., Basallote, M. D., Ape, F., Torstensson, A. und Bjoerk, M. M. (2013) Biological impacts of ocean acidification: a postgraduate perspective on research priorities. Marine Biology, 160 (8). pp. 1789-1805. DOI 10.1007/s00227-012-2033-3. Harms, L., Frickenhaus, S., Schiffer, M., Mark, F. C., Storch, D., Pörtner, H. O., Held, C. und Lucassen, M. (2013) Characterization and analysis of a transcriptome from the boreal spider crab Hyas araneus. Comparative Biochemistry and Physiology Part D: Genomics and Proteomics, 8 (4). pp. 344-351. DOI 10.1016/j.cbd.2013.09.004. Hauck, J., Arrigo, K. R., Hoppema, M., van Dijken, G. L., Völker, C. und Wolf-Gladrow, D. A. (2013) Insignificant buffering capacity of Antarctic shelf carbonates. Global Biogeochemical Cycles, 27 (1). pp. 11-20. DOI 10.1029/2011GB004211. Hauck, J., Völker, C., Wang, T., Hoppema, M., Losch, M. und Wolf-Gladrow, D. A. (2013) Seasonally different carbon flux changes in the Southern Ocean in response to the southern annular mode. Global Biogeochemical Cycles, 27 (4). pp. 1236-1245. DOI 10.1002/2013GB004600. Hofmann, L. C., Straub, S. und Bischof, K. (2013) Elevated CO2 levels affect the activity of nitrate reductase and carbonic anhydrase in the calcifying rhodophyte Corallina officinalis. Journal of Experimental Botany, 64 (4). pp. 899-908. DOI 10.1093/jxb/ers369. Holtmann, W., Stumpp, M., Gutowska, M., Syre, S., Himmerkus, N., Melzner, F. und Bleich, M. (2013) Maintenance of coelomic fluid pH in sea urchins exposed to elevated CO2: the role of body cavity epithelia and stereom dissolution. Marine Biology, 160 (10). pp. 2631-2645. DOI 10.1007/s00227-013-2257-x. Hüning, A., Melzner, F., Thomsen, F., Gutowska, M., Krämer, L., Rosenstiel, P., Pörtner, H. O., Philipp, E. E. R. und Lucassen, M. (2013) Impacts of seawater acidification on mantle gene expression patterns of the Baltic Sea blue mussel; implications for shell formation and energy budget. Marine Biology, 160 (8). pp. 1845-1861. DOI 10.1007/s00227-012-1930-9. Kapaun, U. und Quaas, M. (2013) Does the Optimal Size of a Fish Stock Increase with Environmental Uncertainties?. Environmental & Resource Economics, 54 (2). pp. 293-310. DOI 10.1007/s10640-012-9606-y. Keul, N., Langer, G., de Nooijer, L. J. und Bijma, J. (2013) Effect of ocean acidification on the benthic foraminifera Ammonia sp. is caused by a decrease in carbonate ion concentration. Biogeosciences (BG), 10 (10). pp. 6185-6198. DOI 10.5194/bg-10-6185-2013. Keul, N., Langer, G., de Nooijer, L. J., Nehrke, G., Reichart, G. J. und Bijma, J. (2013) Incorporation of uranium in benthic foraminiferal calcite reflects seawater carbonate ion concentration. Geochemistry, Geophysics, Geosystems, 14 (1). pp. 102-111. DOI 10.1029/2012GC004330. Krause, E., Wichels, A., Giménez, L. und Gerdts, G. (2013) Marine fungi may benefit from ocean acidification. Aquatic Microbial Ecology, 69 (1). pp. 59-67. DOI 10.3354/ame01622. Lohbeck, K. T., Riebesell, U. , Collins, S. und Reusch, T. B. H. (2013) Functional Genetic Divergence in High CO2 adapted E. huxleyi populations. Evolution, 67 . pp. 1892-1900. DOI 10.1111/j.1558-5646.2012.01812.x. Maneja, R. H., Frommel, A., Geffen, A. J., Folkvord, A., Piatkowski, U. , Chang, M. Y. und Clemmesen, C. (2013) Effects of ocean acidification on the calcification of otoliths of larval Atlantic cod Gadus morhua. Marine Ecology Progress Series, 477 . pp. 251-258. DOI 10.3354/meps10146. Maneja, R., Frommel, A., Browman, H. I., Clemmesen, C. , Geffen, A. J., Folkvord, A., Piatkowski, U. , Durif, C. M. F., Bjelland, R. und Skiftesvik, A. B. (2013) The swimming kinematics of larval Atlantic cod, Gadus morhua L., are resilient to elevated seawater pCO2. Marine Biology, 160 (8). pp. 1963-1972. DOI 10.1007/s00227-012-2054-y. Niehoff, B., Schmithüsen, T., Knüppel, N., Daase, M., Czerny, J. und Boxhammer, T. (2013) Mesozooplankton community development at elevated CO2 concentrations: results from a mesocosm experiment in an Arctic fjord. Biogeosciences (BG), 10 (3). pp. 1391-1406. DOI 10.5194/bg-10-1391-2013. Pansch, C. , Nasrolahi, A., Appelhans, Y. und Wahl, M. (2013) Tolerance of juvenile barnacles (Amphibalanus improvisus) to warming and elevated pCO2. Marine Biology, 160 (8). pp. 2023-2035. DOI 10.1007/s00227-012-2069-4. Pansch, C. , Schlegel, P. und Havenhand, J. (2013) Larval development of the barnacle Amphibalanus improvisus responds variably but robustly to near-future ocean acidification. ICES Journal of Marine Science, 70 (4). pp. 805-811. DOI 10.1093/icesjms/fst092. Pätsch, J. und Lorkowski, I. (2013) Comparison of two techniques to separate physical- and biological-mediated pCO2in seawater. Limnology and Oceanography: Methods, 11 (1). pp. 41-52. DOI 10.4319/lom.2013.11.41. Reusch, T. B. H. und Boyd, P. W. (2013) Experimental evolution meets marine phytoplankton. Evolution, 67 . pp. 1849-1859. DOI 10.1111/evo.12035. Sarnthein, M., Schneider, B. und Grootes, P. M. (2013) Peak glacial 14C ventilation ages suggest major draw-down of carbon into the abyssal ocean. Climate of the Past, 9 (6). pp. 2595-2614. DOI 10.5194/cp-9-2595-2013. Schalkhausser, B., Bock, C., Stemmer, K., Brey, T., Pörtner, H. O. und Lannig, G. (2013) Impact of ocean acidification on escape performance of the king scallop, Pecten maximus, from Norway. Marine Biology, 160 (8). pp. 1995-2006. DOI 10.1007/s00227-012-2057-8. Schiffer, M., Harms, L., Pörtner, H. O., Lucassen, M., Mark, F. C. und Storch, D. (2013) Tolerance of Hyas araneus zoea I larvae to elevated seawater PCO2 despite elevated metabolic costs. Marine Biology, 160 (8). pp. 1943-1953. DOI 10.1007/s00227-012-2036-0. Schoo, K., Malzahn, A., Krause, E. und Boersma, M. (2013) Increased carbon dioxide availability alters phytoplankton stoichiometry and affects carbon cycling and growth of a marine planktonic herbivore. Marine Biology, 160 (8). pp. 2145-2155. DOI 10.1007/s00227-012-2121-4. Schulz, K. G., Bellerby, R. G. J., Brussaard, C. P. D., Büdenbender, J., Czerny, J., Engel, A. , Fischer, M., Koch-Klavsen, S., Krug, S., Lischka, S. , Ludwig, A., Meyerhöfer, M., Nondal, G., Silyakova, A., Stuhr, A. und Riebesell, U. (2013) Temporal biomass dynamics of an Arctic plankton bloom in response to increasing levels of atmospheric carbon dioxide. Biogeosciences (BG), 10 . pp. 161-180. DOI 10.5194/bg-10-161-2013. Thomsen, J., Casties, I., Pansch, C. , Körtzinger, A. und Melzner, F. (2013) Food availability outweighs ocean acidification effects in juvenileMytilus edulis: laboratory and field experiments. Global Change Biology, 19 (4). pp. 1017-1027. DOI 10.1111/gcb.12109. Unger, J., Endres, S. , Wannicke, N., Engel, A. , Voss, M., Nausch, G. und Nausch, M. (2013) Response of Nodularia spumigena to pCO2 - Part 3: Turnover of phosphorus compounds. Biogeosciences (BG), 10 . pp. 1483-1499. DOI 10.5194/bg-10-1483-2013. Yildiz, G., Hofmann, L. C., Bischof, K. und Dere, S. (2013) Ultraviolet radiation modulates the physiological responses of the calcified rhodophyte Corallina officinalis to elevated CO2. Botanica Marina, 56 (2). pp. 161-168. DOI 10.1515/bot-2012-0216. de Beer, D., Haeckel, M. , Neumann, J., Wegener, G., Inagaki, F. und Boetius, A. (2013) Saturated CO2 inhibits microbial processes in CO2-vented deep-sea sediments. Biogeosciences (BG), 10 (8). pp. 5639-5649. DOI 10.5194/bg-10-5639-2013. Parker, L. M., Ross, P. M., O'Connor, W. A., Borysko, L., Raftos, D. A. und Pörtner, H. O. (2012) Adult exposure influences offspring response to ocean acidification in oysters. Global Change Biology, 18 (1). pp. 82-92. DOI 10.1111/j.1365-2486.2011.02520.x. Glock, N., Eisenhauer, A. , Liebetrau, V., Wiedenbeck , M., Hensen, C. und Nehrke, G. (2012) EMP and SIMS studies on Mn/Ca and Fe/Ca systematics in benthic foraminifera from the Peruvian OMZ: a contribution to the identification of potential redox proxies and the impact of cleaning protocols. Biogeosciences (BG), 9 . pp. 341-359. DOI 10.5194/bg-9-341-2012. Heinemann, A., Fietzke, J. , Melzner, F., Böhm, F., Thomsen, J., Garbe-Schönberg, D. und Eisenhauer, A. (2012) Conditions of Mytilus edulis extracellular body fluids and shell composition in a pH-treatment experiment: Acid-base status, trace elements and delta B-11. Geochemistry, Geophysics, Geosystems, 13 (1). Q01005. DOI 10.1029/2011GC003790. Appelhans, Y., Thomsen, J., Pansch, C. , Melzner, F. und Wahl, M. (2012) Sour times: seawater acidification effects on growth, feeding behaviour and acid–base status of Asterias rubens and Carcinus maenas. Marine Ecology Progress Series, 459 . pp. 85-98. DOI 10.3354/meps09697. Bach, L. T. , Bauke, C., Meier, K. J. S., Riebesell, U. und Schulz, K. G. (2012) Influence of changing carbonate chemistry on morphology and weight of coccoliths formed by Emiliania huxleyi. Biogeosciences (BG), 9 (8). pp. 3449-3463. DOI 10.5194/bg-9-3449-2012. Bach, L. T. , Riebesell, U. , Sett, S., Febiri, S., Rzepka, P. und Schulz, K. G. (2012) An approach for particle sinking velocity measurements in the 3–400 μm size range and considerations on the effect of temperature on sinking rates. Marine Biology, 159 (8). pp. 1853-1864. DOI 10.1007/s00227-012-1945-2. Borchard, C. und Engel, A. (2012) Organic matter exudation by Emiliania huxleyi under simulated future ocean conditions. Biogeosciences (BG), 9 (8). pp. 3405-3423. DOI 10.5194/bg-9-3405-2012. Form, A. und Riebesell, U. (2012) Acclimation to ocean acidification during long-term CO2 exposure in the cold-water coral Lophelia pertusa. Global Change Biology, 18 (3). pp. 843-853. DOI 10.1111/j.1365-2486.2011.02583.x. Frommel, A., Maneja, R., Lowe, D., Malzahn, A., Geffen, A. J., Folkvord, A., Piatkowski, U. , Reusch, T. B. H. und Clemmesen, C. (2012) Severe tissue damage in Atlantic cod larvae under increasing ocean acidification. Nature Climate Change, 2 . pp. 42-46. DOI 10.1038/NCLIMATE1324. Gao, K., Xu, J., Gao, G., Li, Y., Hutchins, D. A., Huang, B., Wang, L., Zheng, Y., Jin, P., Cai, X., Häder, D. P., Li, W., Xu, K., Liu, N. und Riebesell, U. (2012) Rising CO2 and increased light exposure synergistically reduce marine primary productivity. Nature Climate Change, 2 . pp. 519-523. DOI 10.1038/NCLIMATE1507. Gilbert, J. A., Glas, M. S., Fabricius, K. E., de Beer, D. und Uthicke, S. (2012) The O2, pH and Ca2+ Microenvironment of Benthic Foraminifera in a High CO2 World. PLoS ONE, 7 (11). e50010. DOI 10.1371/journal.pone.0050010. Glas, M. S., Langer, G. und Keul, N. (2012) Calcification acidifies the microenvironment of a benthic foraminifer (Ammonia sp.). Journal of Experimental Marine Biology and Ecology, 424-425 . pp. 53-58. DOI 10.1016/j.jembe.2012.05.006. Glas, M. S., Sato, Y., Ulstrup, K. E. und Bourne, D. G. (2012) Biogeochemical conditions determine virulence of black band disease in corals. The ISME Journal, 6 (8). pp. 1526-1534. DOI 10.1038/ismej.2012.2. Hahn, S., Rodolfo-Metalpa, R., Griesshaber, E., Schmahl, W. W., Buhl, D., Hall-Spencer, J. M., Baggini, C., Fehr, K. T. und Immenhauser, A. (2012) Marine bivalve shell geochemistry and ultrastructure from modern low pH environments: environmental effect versus experimental bias. Biogeosciences (BG), 9 (5). pp. 1897-1914. DOI 10.5194/bg-9-1897-2012. Hauck, J., Gerdes, D., Hillenbrand, C. D., Hoppema, M., Kuhn, G., Nehrke, G., Völker, C. und Wolf-Gladrow, D. A. (2012) Distribution and mineralogy of carbonate sediments on Antarctic shelves. Journal of Marine Systems, 90 (1). pp. 77-87. DOI 10.1016/j.jmarsys.2011.09.005. Hofmann, L. C., Straub, S. und Bischof, K. (2012) Competition between calcifying and noncalcifying temperate marine macroalgae under elevated CO2 levels. Marine Ecology Progress Series, 464 . pp. 89-105. DOI 10.3354/meps09892. Hofmann, L. C., Yildiz, G., Hanelt, D. und Bischof, K. (2012) Physiological responses of the calcifying rhodophyte, Corallina officinalis (L.), to future CO2 levels. Marine Biology, 159 (4). pp. 783-792. DOI 10.1007/s00227-011-1854-9. Kirchman, D. L., Krause, E., Wichels, A., Giménez, L., Lunau, M., Schilhabel, M. B. und Gerdts, G. (2012) Small Changes in pH Have Direct Effects on Marine Bacterial Community Composition: A Microcosm Approach. PLoS ONE, 7 (10). e47035. DOI 10.1371/journal.pone.0047035. Krause, E., Wichels, A., Giménez, L., Lunau, M., Schilhabel, M. B. und Gerdts, G. (2012) Small Changes in pH Have Direct Effects on Marine Bacterial Community Composition: A Microcosm Approach. PLoS ONE, 7 (10). e47035. DOI 10.1371/journal.pone.0047035. Langer, G., Oetjen, K. und Brenneis, T. (2012) Calcification of Calcidiscus leptoporus under nitrogen and phosphorus limitation. Journal of Experimental Marine Biology and Ecology, 413 . pp. 131-137. DOI 10.1016/j.jembe.2011.11.028. Lischka, S. und Riebesell, U. (2012) Synergistic effects of ocean acidification and warming on overwintering pteropods in the Arctic. Global Change Biology, 18 (12). pp. 3517-3528. DOI 10.1111/gcb.12020. Lohbeck, K. T., Riebesell, U. und Reusch, T. B. H. (2012) Adaptive evolution of a key phytoplankton species to ocean acidification. Nature Geoscience, 5 . pp. 346-351. DOI 10.1038/ngeo1441. Lommer, M., Specht, M., Roy, A. S., Kraemer, L., Andreson, R., Gutowska, M., Wolf, J., Bergner, S. V., Schilhabel, M. B., Klostermeier, U. C., Beiko, R. G., Rosenstiel, P., Hippler, M. und LaRoche, J. (2012) Genome and low-iron response of an oceanic diatom adapted to chronic iron limitation. Genome Biology, 13 (7). R66. DOI 10.1186/gb-2012-13-7-r66. Müller, M. N., Beaufort, L., Bernard, O., Pedrotti, M. L., Talec, A. und Sciandra, A. (2012) Influence of CO2 and nitrogen limitation on the coccolith volume of Emiliania huxleyi (Haptophyta). Biogeosciences (BG), 9 (10). pp. 4155-4167. DOI 10.5194/bg-9-4155-2012. Nasrolahi, A., Pansch, C. , Lenz, M. und Wahl, M. (2012) Being young in a changing world: how temperature and salinity changes interactively modify the performance of larval stages of the barnacle Amphibalanus improvisus. Marine Biology, 159 (2). pp. 331-340. DOI 10.1007/s00227-011-1811-7. Olischläger, M., Bartsch, I., Gutow, L. und Wiencke, C. (2012) Effects of ocean acidification on different life-cycle stages of the kelp Laminaria hyperborea (Phaeophyceae). Botanica Marina, 55 (5). DOI 10.1515/bot-2012-0163. Pansch, C. , Nasrolahi, A., Appelhans, Y. und Wahl, M. (2012) Impacts of ocean warming and acidification on the larval development of the barnacle Amphibalanus improvisus. Journal of Experimental Marine Biology and Ecology, 420-421 . pp. 48-55. DOI 10.1016/j.jembe.2012.03.023. Ragazzola, F., Foster, L. C., Form, A., Anderson, P. S. L., Hansteen, T. H. und Fietzke, J. (2012) Ocean acidification weakens the structural integrity of coralline algae. Global Change Biology, 18 (9). pp. 2804-2812. DOI 10.1111/j.1365-2486.2012.02756.x. Rao, A. M. F., Polerecky, L., Ionescu, D., Meysman, F. J. R. und de Beer, D. (2012) The influence of pore-water advection, benthic photosynthesis, and respiration on calcium carbonate dynamics in reef sands. Limnology and Oceanography, 57 (3). pp. 809-825. DOI 10.4319/lo.2012.57.3.0809. Sarker, Y., Bartsch, I., Olischläger, M., Gutow, L. und Wiencke, C. (2012) Combined effects of CO2, temperature, irradiance and time on the physiological performance of Chondrus chrispus (Rhodophyta). Botanica Marina, 56 (1). pp. 63-74. DOI 10.1515/bot-2012-0143. Schmidt, G. M., Phongsuwan, N., Jantzen, C., Roder, C., Khokiattiwong, S. und Richter, C. (2012) Coral community composition and reef development at the Similan Islands, Andaman Sea, in response to strong environmental variations. Marine Ecology Progress Series, 456 . pp. 113-126. DOI 10.3354/meps09682. Stumpp, M., Hu, M. Y. A., Melzner, F., Gutowska, M., Dorey, N., Himmerkus, N., Holtmann, W. C., Dupont, S. T., Thorndyke, M. C. und Bleich, M. (2012) Acidified seawater impacts sea urchin larvae pH regulatory systems relevant for calcification. PNAS Proceedings of the National Academy of Sciences of the United States of America, 109 (44). pp. 18192-18197. DOI 10.1073/pnas.1209174109. Stumpp, M., Trübenbach, K., Brennecke, D., Hu, M. Y. A. und Melzner, F. (2012) Resource allocation and extracellular acid–base status in the sea urchin Strongylocentrotus droebachiensis in response to CO2 induced seawater acidification. Aquatic Toxicology, 110-111 . pp. 194-207. DOI 10.1016/j.aquatox.2011.12.020. Wall, M. und Nehrke, G. (2012) Reconstructing skeletal fiber arrangement and growth mode in the coral Porites lutea (Cnidaria, Scleractinia): a confocal Raman microscopy study. Biogeosciences (BG), 9 (11). pp. 4885-4895. DOI 10.5194/bg-9-4885-2012. Wall, M., Schmidt, G. M., Janjang, P., Khokkiattiwong, S. und Richter, C. (2012) Differential impact of monsoon and large amplitude internal waves on coral reef development in the Andaman Sea. PLoS ONE, 7 (11). e50207. DOI 10.1371/journal.pone.0050207. Wannicke, N., Endres, S. , Engel, A. , Grossart, H. P., Nausch, M., Unger, J. und Voss, M. (2012) Response of Nodularia spumigena to pCO2 – Part 1: Growth, production and nitrogen cycling. Biogeosciences (BG), 9 (8). pp. 2973-2988. DOI 10.5194/bg-9-2973-2012. de Jesus Mendes, P. A. und Thomsen, L. (2012) Effects of Ocean Acidification on the Ballast of Surface Aggregates Sinking through the Twilight Zone. PLoS ONE, 7 (12). e50865. DOI 10.1371/journal.pone.0050865. Mackinder, L., Wheeler, G., Schroeder, D., von Dassow, P., Riebesell, U. und Brownlee, C. (2011) Expression of biomineralization-related ion transport genes in Emiliania huxleyi. Environmental Microbiology, 13 (12). pp. 3250-3265. DOI 10.1111/j.1462-2920.2011.02561.x. Arnosti, C., Grossart, H. P., Mühling, M., Joint, I. und Passow, U. (2011) Dynamics of extracellular enzyme activities in seawater under changed atmospheric pCO2: a mesocosm investigation. Aquatic Microbial Ecology, 64 (3). pp. 285-298. DOI 10.3354/ame01522. Bach, L. T. , Riebesell, U. und Schulz, K. (2011) Distinguishing between the effects of ocean acidification and ocean carbonation in the coccolithophore Emiliania huxleyi. Limnology and Oceanography, 56 (6). pp. 2040-2050. DOI 10.4319/lo.2011.56.6.2040. Büdenbender, J., Riebesell, U. und Form, A. (2011) Calcification of the Arctic coralline red algae Lithothamnion glaciale in response to elevated CO2. Marine Ecology Progress Series, 441 . pp. 79-87. DOI 10.3354/meps09405. Fabricius, K. E., Langdon, C., Uthicke, S., Humphrey, C., Noonan, S., De’ath, G., Okazaki, R., Muehllehner, N., Glas, M. S. und Lough, J. M. (2011) Losers and winners in coral reefs acclimatized to elevated carbon dioxide concentrations. Nature Climate Change, 1 (3). pp. 165-169. DOI 10.1038/nclimate1122. Franke, A. und Clemmesen, C. (2011) Effect of ocean acidification on early life stages of Atlantic herring (Clupea harengus L.). Biogeosciences (BG), 8 . pp. 3697-3707. DOI 10.5194/bg-8-3697-2011. Heinemann, A., Hiebenthal, C. , Fietzke, J. , Eisenhauer, A. und Wahl, M. (2011) Disentangling the Biological and Environmental Control of M. edulis Shell Chemistry. Geochemistry, Geophysics, Geosystems, 12 (3). Q03009. DOI 10.1029/2010GC003340. Hoppe, C. J. M., Langer, G. und Rost, B. (2011) Emiliania huxleyi shows identical responses to elevated pCO2 in TA and DIC manipulations. Journal of Experimental Marine Biology and Ecology, 406 (1-2). pp. 54-62. DOI 10.1016/j.jembe.2011.06.008. Hu, M. Y. A., Tseng, Y. C., Lin, L. Y., Chen, P. Y., Charmantier-Daures, M., Hwang, P. P. und Melzner, F. (2011) New insights into ion regulation of cephalopod molluscs: a role of epidermal ionocytes in acid-base regulation during embryogenesis. American Journal of Physiology: Regulatory, Integrative and Comparative Physiology, 301 (6). R1700-R1709. DOI 10.1152/ajpregu.00107.2011. Hu, M. Y. A., Tseng, Y. C., Stumpp, M., Gutowska, M., Kiko, R. , Lucassen, M. und Melzner, F. (2011) Elevated seawater pCO2 differentially affects branchial acid-base transporters over the course of development in the cephalopod Sepia officinalis . American Journal of Physiology: Regulatory, Integrative and Comparative Physiology, 300 . pp. 1100-1114. DOI 10.1152/ajpregu.00653.2010. Krause-Nehring, J., Klügel, A., Nehrke, G., Brellochs, B. und Brey, T. (2011) Impact of sample pretreatment on the measured element concentrations in the bivalveArctica islandica. Geochemistry, Geophysics, Geosystems, 12 (7). DOI 10.1029/2011GC003630. Krug, S., Schulz, K. und Riebesell, U. (2011) Effects of changes in carbonate chemistry speciation on Coccolithus braarudii: a discussion of coccolithophorid sensitivities. Biogeosciences (BG), 8 . pp. 771-777. DOI 10.5194/bg-8-771-2011. Langer, G. und Bode, M. (2011) CO2 mediation of adverse effects of seawater acidification inCalcidiscus leptoporus. Geochemistry, Geophysics, Geosystems, 12 (5). DOI 10.1029/2010GC003393. Langer, G., Probert, I., Nehrke, G. und Ziveri, P. (2011) The morphological response of Emiliania huxleyi to seawater carbonate chemistry changes: an inter-strain comparison. Journal of Nannoplankton Research, 32 (1). pp. 29-34. Lischka, S. , Büdenbender, J., Boxhammer, T. und Riebesell, U. (2011) Impact of ocean acidification and elevated temperatures on early juveniles of the polar shelled pteropod Limacina helicina: mortality, shell degradation, and shell growth. Biogeosciences (BG), 8 . pp. 919-932. DOI 10.5194/bg-8-919-2011. Maneja, R., Piatkowski, U. und Melzner, F. (2011) Effects of ocean acidification on statolith calcification and prey capture in early life cuttlefish, Sepia officinalis. Journal of Shellfish Research, 30 (3). p. 1011. DOI 10.2983/035.030.0342. Melzner, F., Stange, P., Trübenbach, K., Thomsen, J., Casties, I., Panknin, U., Gorb, S. N. und Gutowska, M. A. (2011) Food Supply and Seawater pCO2 Impact Calcification and Internal Shell Dissolution in the Blue Mussel Mytilus edulis. PLoS ONE, 6 (9). e24223. DOI 10.1371/journal.pone.0024223. Nehrke, G. und Nouet, J. (2011) Confocal Raman microscope mapping as a tool to describe different mineral and organic phases at high spatial resolution within marine biogenic carbonates: case study on Nerita undata (Gastropoda, Neritopsina). Biogeosciences (BG), 8 (12). pp. 3761-3769. DOI 10.5194/bg-8-3761-2011. Specht, M., Kuhlgert, S., Fufezan, C. und Hippler, M. (2011) Proteomics to go: Proteomatic enables the user-friendly creation of versatile MS/MS data evaluation workflows. Bioinformatics, 27 (8). pp. 1183-1184. DOI 10.1093/bioinformatics/btr081. Specht, M., Stanke, M., Terashima, M., Naumann-Busch, B., Janßen, I., Höhner, R., Hom, E. F. Y., Liang, C. und Hippler, M. (2011) Concerted action of the new Genomic Peptide Finder and AUGUSTUS allows for automated proteogenomic annotation of the Chlamydomonas reinhardtii genome. PROTEOMICS, 11 (9). pp. 1814-1823. DOI 10.1002/pmic.201000621. 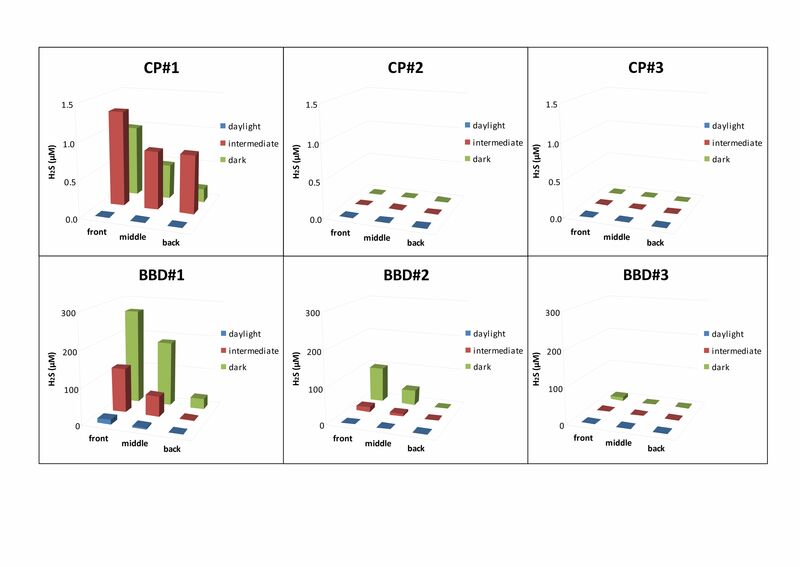 Stumpp, M., Dupont, S., Thorndyke, M. C. und Melzner, F. (2011) CO2 induced seawater acidification impacts sea urchin larval development II: Gene expression patterns in pluteus larvae. Comparative Biochemistry and Physiology A - Molecular and Integrative Physiology, 160 (3). pp. 320-330. DOI 10.1016/j.cbpa.2011.06.023. Stumpp, M., Wren, J., Melzner, F., Thorndyke, M. C. und Dupont, S. T. (2011) CO2 induced seawater acidification impacts sea urchin larval development I: Elevated metabolic rates decrease scope for growth and induce developmental delay. Comparative Biochemistry and Physiology A - Molecular and Integrative Physiology, 160 (3). pp. 331-340. DOI 10.1016/j.cbpa.2011.06.022. Suffrian, K., Schulz, K. G., Gutowska, M., Riebesell, U. und Bleich, M. (2011) Cellular pH measurements in Emiliania huxleyi reveal pronounced membrane proton permeability. New Phytologist, 190 (3). pp. 595-608. DOI 10.1111/j.1469-8137.2010.03633.x. Walther, K., Sartoris, F. J. und Pörtner, H. O. (2011) Impacts of temperature and acidification on larval calcium incorporation of the spider crab Hyas araneus from different latitudes (54° vs. 79°N). Marine Biology, 158 (9). pp. 2043-2053. DOI 10.1007/s00227-011-1711-x. Fietzke, J. , Heinemann, A., Taubner, I., Böhm, F., Erez, J. und Eisenhauer, A. (2010) Boron isotope ratio determination in carbonates /via/ LA-MC-ICP-MS using soda-lime glass standards as reference material . Journal of Analytical Atomic Spectrometry, 25 (12). pp. 1953-1957. DOI 10.1039/C0JA00036A. Frommel, A., Stiebens, V., Clemmesen, C. und Havenhand, J. (2010) Effect of ocean acidification on marine fish sperm (Baltic cod: Gadus morhua). Biogeosciences (BG), 7 . pp. 3915-3919. DOI 10.5194/bg-7-3915-2010. Gutowska, M., Melzner, F., Langenbuch, M., Bock, C., Claireaux, G. und Pörtner, H. O. (2010) Acid–base regulatory ability of the cephalopod (Sepia officinalis) in response to environmental hypercapnia. Journal of Comparative Physiology B - Biochemical Systemic and Environmental Physiology, 180 (3). pp. 323-335. DOI 10.1007/s00360-009-0412-y. Gutowska, M., Melzner, F., Pörtner, H. O. und Meier, S. (2010) Cuttlebone calcification increases during exposure to elevated seawater pCO2 in the cephalopod Sepia officinalis. Marine Biology, 157 (7). pp. 1653-1663. DOI 10.1007/s00227-010-1438-0. Hu, M. Y. A., Sucré, E., Charmantier-Daures, M., Charmantier, G., Lucassen, M., Himmerkus, N. und Melzner, F. (2010) Localization of ion-regulatory epithelia in embryos and hatchlings of two cephalopods. Cell and Tissue Research, 339 (3). pp. 571-583. DOI 10.1007/s00441-009-0921-8. Koeve, W. und Kähler, P. (2010) Heterotrophic denitrification vs autotrophic anammox - quantifying collateral effects on the oceanic carbon cycle. Biogeosciences (BG), 7 . pp. 2327-2337. DOI 10.5194/bg-7-2327-2010. Koeve, W. und Kähler, P. (2010) Ocean science: Balancing ocean nitrogen. Nature Geoscience, 3 (6). pp. 383-384. DOI 10.1038/ngeo884. Kranz, S. A., Wolf-Gladrow, D., Nehrke, G., Langer, G. und Rost, B. (2010) Calcium carbonate precipitation induced by the growth of the marine cyanobacteria Trichodesmium. Limnology and Oceanography, 55 (6). pp. 2563-2569. DOI 10.4319/lo.2010.55.6.2563. Langer, G., de Nooijer, L. J. und Oetjen, K. (2010) On the role of the cytoskeleton in coccolith morphogenesis: the effect of cytoskeleton inhibitors. Journal of Phycology, 46 (6). pp. 1252-1256. DOI 10.1111/j.1529-8817.2010.00916.x. Lannig, G., Eilers, S., Pörtner, H. O., Sokolova, I. M. und Bock, C. (2010) Impact of Ocean Acidification on Energy Metabolism of Oyster, Crassostrea gigas—Changes in Metabolic Pathways and Thermal Response. Marine Drugs, 8 (8). pp. 2318-2339. DOI 10.3390/md8082318. Lommer, M., Roy, A. S., Schilhabel, M., Schreiber, S., Rosenstiel, P. und LaRoche, J. (2010) Recent transfer of an iron-regulated gene from the plastid to the nuclear genome in an oceanic diatom adapted to chronic iron limitation. BMC Genomics, 11 . p. 718. DOI 10.1186/1471-2164-11-718. Müller, M., Schulz, K. und Riebesell, U. (2010) Effects of long-term high CO2 exposure on two species of coccolithophores. Biogeosciences (BG), 7 (3). pp. 1109-1116. DOI 10.5194/bg-7-1109-2010. Terashima, M., Specht, M., Naumann, B. und Hippler, M. (2010) Characterizing the Anaerobic Response of Chlamydomonas reinhardtii by Quantitative Proteomics. Molecular & Cellular Proteomics, 9 (7). pp. 1514-1532. DOI 10.1074/mcp.M900421-MCP200. Thomsen, J. und Melzner, F. (2010) Moderate seawater acidification does not elicit long-term metabolic depression in the blue mussel Mytilus edulis. Marine Biology, 157 . pp. 2667-2676. DOI 10.1007/s00227-010-1527-0. Thomsen, J., Gutowska, M., Saphörster, J., Heinemann, A., Trübenbach, K., Fietzke, J. , Hiebenthal, C. , Eisenhauer, A. , Körtzinger, A. , Wahl, M. und Melzner, F. (2010) Calcifying invertebrates succeed in a naturally CO2 enriched coastal habitat but are threatened by high levels of future acidification. Biogeosciences (BG), 7 (11). pp. 3879-3891. DOI 10.5194/bg-7-3879-2010. Walther, K., Anger, K. und Pörtner, H. O. (2010) Effects of ocean acidification and warming on the larval development of the spider crab Hyas araneus from different latitudes (54° vs. 79°N). Marine Ecology Progress Series, 417 . pp. 159-170. DOI 10.3354/meps08807. Gutowska, M. und Melzner, F. (2009) Abiotic conditions in cephalopod (Sepia officinalis) eggs: embryonic development at low pH and high pCO2. Marine Biology, 156 . pp. 515-519. DOI 10.1007/s00227-008-1096-7. Melzner, F., Gutowska, M. A., Langenbuch, M., Dupont, S., Lucassen, M., Thorndyke, M. C., Bleich, M. und Pörtner, H. O. (2009) Physiological basis for high CO2 tolerance in marine ectothermic animals: pre-adaptation through lifestyle and ontogeny?. Biogeosciences (BG), 6 . pp. 2313-2331. DOI 10.5194/bg-6-2313-2009. Crawfurd, K. J., Brussaard, C. P. D. und Riebesell, U. (2016) Shifts in the microbial community in the Baltic Sea with increasing CO2. Biogeosciences Discussions . pp. 1-51. DOI 10.5194/bg-2015-606. Winde, V., Böttcher, M. E., Voß, M., Fenner, A. K. und Schmiedinger, I. (2015) Is the biogeochemical composition of Fucus vesiculosus reflecting anthropogenic environmental impacts on coastal ecosystems of the Baltic Sea and the North Sea?. Leibniz-Institut für Ostseeforschung Warnemünde : Jahresbericht - Annual Report, 2014 . pp. 33-36. Regenberg, A., Schneider, B. und Gangstoe, R. (2013) Sensitivity of pelagic CaCO3 dissolution to ocean acidification in an ocean biogeochemical model. Biogeosciences Discussions, 10 (7). pp. 11343-11373. DOI 10.5194/bgd-10-11343-2013. Bordelon-Katrynski, L. A. und Schneider, B. (2012) Feedbacks of CO2 dependent dissolved organic carbon production on atmospheric CO2 in an ocean biogeochemical model. Biogeosciences Discussions, 9 (7). pp. 7983-8011. DOI 10.5194/bgd-9-7983-2012. Pörtner, H. O., Gutowska, M., Ishimatsu, A., Lucassen, A., Melzner, F. und Seibel, B. (2011) Effects of ocean acidification on nektonic organisms. In: Ocean Acidification. , ed. by Gattuso, J. P. und Hansson, L.. Oxford University Press, Oxford, U.K, pp. 154-175. Riebesell, U. und Schulz, K. (2011) Auswirkungen der Ozeanversauerung auf marine Lebensprozesse. In: Warnsignal Klima: Die Meeres – Änderungen und Risiken. , ed. by Lozan, J. L., Graßl, H., Karbe, L. und Reise, K.. Buchreihe "Warnsignale" . Wissenschaftliche Auswertungen, Hamburg, Germany, pp. 172-176. Böttcher, M. E. und Dietzel, M. (2010) Metal-ion partitioning during low-temperature precipitation and dissolution of anhydrous carbonates and sulphates. In: Ion partitioning in ambient-temperature aqueous systems. , ed. by Prieto, M. und Stoll, H.. EMU Notes in Mineralogy, 10 . Mineralogical Society, Twickenham, UK, pp. 139-187. ISBN 978-0903056-26-7 DOI 10.1180/EMU-notes.10.4. Pörtner, H. O., Bickmeyer, U., Bleich, M., Bock, C., Brownlee, C., Melzner, F., Michaelidis, B., Sartoris, F. J. und Storch, D. (2010) Studies of acid-base status and regulation. In: Guide to best practices for ocean acidification research and data reporting. ; Chapter 9 , ed. by Riebesell, U., Fabry, V. J., Hansson, L. und Gattuso, J. P.. Publications Office of the European Union, Luxembourg, pp. 137-166. Pörtner, H. O., Dickson, A. und Gattuso, J. P. (2010) Terminology and units for parameters relevant to the carbonate system. In: Guide to best practices for ocean acidification research and data reporting. ; Chapter 10 , ed. by Riebesell, U., Fabry, V. J., Hansson, L. und Gattuso, J. P.. Publications Office of the European Union, Luxembourg, pp. 167-180. Pörtner, H. O., Dupont, S., Melzner, F., Storch, D. und Thorndyke, M. (2010) Studies of metabolic rate and other characters across life stages. In: Guide to best practices for ocean acidification research and data reporting. ; Chapter 10 , ed. by Riebesell, U., Fabry, V. J., Hansson, L. und Gattuso, J. P.. Publications Office of the European Union, Luxembourg, pp. 167-180. Pörtner, H. O., Caldeira, K. und Munday, P. (2011) Scaling up to ecosystems: the state of knowledge, key uncertainties and the way forward. [Paper] In: IPCC Workshop on Impacts of Ocean Acidification on Marine Biology and Ecosystems . , 17.-19.01.2011, Bankoku Shinryokan Okinawa, Japan . Hassenrück, C., Fink, A., Tegetmeyer, H., Hofmann, L., Lichtschlag, A., Ramette, A. und de Beer, D. (2016) Microbial processes in the sediment at a shallow-water hydrothermal vent in a tropical coral reef. [Vortrag] In: 13. International Coral Reef Symposium. , 19.-24.06.2016, Honululu, Hawaii, USA . Lannig, G., Schalkhausser, B., Pörtner, H. O. und Bock, C. (2016) Higher sensitivity to ocean warming and acidification in boreal than temperate great scallop, Pecten maximus. [Vortrag] In: 4. International Symposium on the Ocean in a High-CO2 World. , 03.-06.05.2016, Hobart, Tasmania . Stapp, L. S., Parker, L. M., O'Connor, W. A., Bock, C., Ross, P. M., Pörtner, H. O. und Lannig, G. (2016) Different sensitivities to ocean acidification between populations of the Sydney Rock Oyster: Role of filtration and ion-regulatory capacities. [Vortrag] In: 4. International Symposium on the Ocean in a High-CO2 World. , 03.-06.05.2016, Hobart, Tasmania . Stiasny, M. , Hänsel, M., Clemmesen, C. , Dahlke, F., Mittermayer, F. , Quaas, M., Reusch, T. B. H. , Storch, D. und Voss, R. (2016) Socio-economic impacts of ocean acidification and warming on Barents Sea Cod. [Vortrag] In: BIOACID Jahrestreffen 2016. , 28.09.2016, Bremen, Germany . Tonkes, H., Sartoris, F. J. und Niehoff, B. (2016) Influence of food quality on carbon and nitrogen budget of Calanus glacialis (Copepoda). [Vortrag] In: ICES/PICES 6. Zooplankton Production Symposium "New Challenges in a Changing Ocean". , 09.-13.05.2016, Bergen, Norway . Zark, M. (2016) Effects of ocean acidification on marine dissolved organic matter: Results from two mesocosm studies. [Eingeladener Vortrag] In: Limnology Seminar. , 05.04.2016, Uppsala, Sweden . Aberle, N. (2015) Phytoplankton-protozooplankton interactions in a changing environment: shifts in phenology and trophic relations. [Vortrag] In: Institut für Chemie und Biologie des Meeres ICBM. , 04.02.2015, Oldenburg, Germany . Aberle, N. (2015) Phytoplankton-protozooplankton interactions in a changing environment: shifts in phenology and trophic relations. [Vortrag] In: Institut für Hydrobiologie und Fischereibiologie. , 03.07.2015, Hamburg, Germany . Aberle, N., Horn, H. G., Lewandowska, A. M. und Sommer, U. (2015) Microzooplankton in a changing environment: shifts in phenology and trophic relations. [Vortrag] In: ICES/PICES 6th Zooplankton Production Symposium "New Challenges in a Changing Ocean". , 09.-13.05.2015, Bergen, Norway . Al-Janabi, B., Kruse, I. und Wahl, M. (2015) Correlated and anti-correlated sensitivities to global change factors will determine the fate of Fucus vesiculosus. [Vortrag] In: BIOACID II Final Meeting. , 06.10.2015, Kiel, Germany . Al-Janabi, B., Kruse, I. und Wahl, M. (2015) Interaction between intraspecific genetic diversity and environmental stress in early life-stage macroalgae. [Vortrag] In: Aquatic Sciences Meetin 2015. , 23.02.2015, Granada, Spain . Al-Janabi, B., Kruse, I. und Wahl, M. (2015) The interaction between intraspecific genetic diversity and global environmental change in early life-stage Fucus vesiculosus. [Vortrag] In: Aquatic Biodiversity and Ecosystems Conference. , 01.09.2015, Liverpool, UK . Al-Janabi, B., Kruse, I., Graiff, A., Karsten, U. und Wahl, M. (2015) Tolerance to climate change of early life-stage Fucus Vesiculosus varies among sibling groups. [Vortrag] In: 6. European Phycological Congress (EPC6). , 23.-28.08.2015, London, UK ; pp. 106-107 . DOI 10.1080/09670262.2015.1069489. European Journal of Phycology, 50 (Suppl. 1). Alguero-Muniz, M., Malzahn, A. M. und Boersma, M. (2015) Mesozooplankton community development affected by ocean acidification: results from a long-term near-natural conditions experiment. [Vortrag] In: ASLO Aquatic Sciences Meeting 2015. , 22.-27.02.2015, Granada, Spain . Alguero-Muniz, M., Meunier, C. L., Ecker, U., Holst, S. und Boersma, M. (2015) Climate change effects on early life stages of the Moon jellyfish (Aurelia aurita, Scyphomedusae): coping with ocean acidification, deoxygenation and warming. [Vortrag] In: PhD-Day, AWI. , 2015, Helgoland, Germany . Alguero-Muniz, M., Meunier, C. L., Ecker, U., Holst, S. und Boersma, M. (2015) Climate change effects on early life stages of the Moon jellyfish (Aurelia aurita, Scyphomedusae): coping with ocean acidification, deoxygenation and warming. [Vortrag] In: European Marine Biology Symposium 2015 (EMBS 50). , 21.-25.09.2015, Helgoland, Germany . Bergen, B., Endres, S. , Engel, A. , Sommer, U. und Jürgens, K. (2015) Effect of acidification and warming on planktonic bacterial communities during two seasonal phytoplankton bloom mesocosms. [Vortrag] In: ASLO Aquatic Sciences Meeting 2015. , 22.-27.02.2015, Granada, Spain . Clemmesen, C. , Listmann, L. , Sswat, M. , Stiasny, M. , Maneja, R., Frommel, A., Geffen, A. und Reusch, T. B. H. (2015) Physiological response on a new level – gene expression analysis in herring larvae in relation to CO2. [Vortrag] In: 39. Annual Larval Fish Conference. , 12.-16.07.2015, Wien, Austria . Endres, S. , Unger, J., Wannicke, N., Nausch, M., Voss, M. und Engel, A. (2015) Response of the filamentous cyanobacterium Nodularia spumigena to pCO2 - Exudation and extracellular enzymes. [Vortrag] In: International Workshop „Marine research and management“. , 12.06.2015, University of Riga, Latvia . Fink, A., Hassenrück, C., Guilini, C., Fabricius, K. und de Beer, D. (2015) Sediment biogeochemistry along a natural pH gradient in a tropical coral reef. [Vortrag] In: Microsensor Workshop 2. , 25.05.-06.06.2015, AIMS, Townsville, Australia . Fink, A., Lichtschlag, A., Fabricius, K. und de Beer, D. (2015) Sediment biogeochemistry along a natural pH gradient in a tropical coral reef. [Vortrag] In: ASLO Aquatic Sciences Meeting 2015. , 22.-27.02.2015, Granada, Spain . Hassenrück, C., Fink, A., Tegetmeyer, H., de Beer, D. und Ramette, A. (2015) Microbial community composition and functions in sediments of naturally CO2-rich coral reefs. [Vortrag] In: ASLO Aquatic Sciences Meeting 2015. , 22.-27.02.2015, Granada, Spain . Horn, H. G., Sander, N., Alguero-Muniz, M., Garzke, J., Löder, M. G. J., Ludwig, A., Boersma, M., Riebesell, U. und Aberle, N. (2015) Life in the future ocean: effects of end-of-century warming and acidification conditions on microzooplankton. [Vortrag] In: AWI Science Meeting. , 27.10.2015, Bremerhaven, Germany . Horn, H. G., Sander, N., Alguero-Muniz, M., Löder, M. G. J., Boersma, M., Riebesell, U. und Aberle, N. (2015) Does ocean acidification affect North Sea microzooplankton communities?. [Vortrag] In: European Marine Biology Symposium 2015. , 21.-25.09.2015, Helgoland, Germany . Horn, H. G., Sander, N., Alguero-Muniz, M., Löder, M. G. J., Boersma, M., Riebesell, U. und Aberle, N. (2015) Effects of ocean acidification on North Sea microzooplankton communities. [Vortrag] In: PhD-Day, AWI. , 01.-04.06.2015, Sylt, Germany . Horn, H. G., Sander, N., Alguero-Muniz, M., Löder, M. G. J., Boersma, M., Riebesell, U. und Aberle, N. (2015) Effects of ocean acidification on North Sea microzooplankton communities. [Vortrag] In: ASLO Aquatic Sciences Meeting 2015. , 22.-27.02.2015, Granada, Spain . Koenigstein, S. (2015) Model-based integration of experimental results and human uses to identify management options for marine ecosystems under climate change. [Vortrag] In: 3. International Symposium on Effects of Climate Change on the World's Oceans. , 21.-27.03.2015, Santos, Brazil . Koenigstein, S. und Gößling-Reisemann, S. (2015) Participatory modeling of climate change impacts on marine ecosystem services. [Vortrag] In: YOUMARES 6 - A Journey into the Blue: Ocean Research and Innovation. , 16.-18.09.2015, Bremerhaven, Germany . Koenigstein, S. und Gößling-Reisemann, S. (2015) Participatory modelling of ocean acidification and warming impacts on a subpolar marine systems to identify adaptation options. [Vortrag] In: IMBER IMBIZO VI: Marine and human systems: Adressing multiple scales and mutliple stressors. , 26.-30.10.2015, Trieste, Italy . Koeve, W. und Kähler, P. (2015) A Puzzle of Oceanic Oxygen Utilization. [Vortrag] In: ASLO Aquatic Sciences Meeting 2015. , 22.-27.02.2015, Granada, Spain . Kunz, K. L. (2015) Whole animal performance under OAW: A comparison of Polar cod and Atlantic cod. [Vortrag] In: Bioacid II Data Workshop "Modelling". , 10.03.2015, Bremen, Germany . Kunz, K. L., Pörtner, H. O., Knust, R. und Mark, F. C. (2015) Ocean acidification and warming: the physiology of two gadoid species under future ocean water conditions. [Eingeladener Vortrag] In: ESSAS Annual Meeting. , 15.-17.06.2015, Seattle, WA, USA . Kunz, K. L., Pörtner, H. O., Knust, R. und Mark, F. C. (2015) Warm and acidic: No problem for gadoid fish species?. [Vortrag] In: NOAA, Hatfield Marine Science Center. , 18.06.2015, Newport, OR, USA . Lange, J. A. F., Schwenk, K. und Boersma, M. (2015) Effects of ocean acidification on zooplankton: Metabarcoding results from a long-term mesocosmos experiment in the North Sea. [Vortrag] In: ASLO Aquatic Sciences Meeting 2015. , 22.-27.02.2015, Granada, Spain . Lange, J. A. F., Schwenk, K. und Boersma, M. (2015) Effects of ocean acidification on zooplankton: Metabarcoding results from a long-term mesocosmos experiment in the North Sea. [Vortrag] In: European Marine Biology Symposium 2015. , 21.-25.09.2015, Helgoland, Germany . Lannig, G. und Stapp, L. (2015) Thermal sensitivity of cell metabolism of different Antarctic fish species mirrors organism temperature tolerance. [Vortrag] In: 9. International Congress of Comparative Physiology and Biochemistry (ICCPB). , 23.-28.08.2015, Krakow, Poland . Mark, F. C. (2015) Global warming, ocean acidification & fish physiology: do we need to worry?. [Vortrag] In: Biology Seminar Universität Bern. , 16.07.2015, Bern, Switzerland . Mark, F. C. (2015) A role for mitochondria in transgenerational plasticity? Maternal effects mediate impacts of a warming ocean in marine sticklebacks. [Vortrag] In: SEB Conference. , 29.06.-03.07.2015, Prague, Czech Republic . Pansch, A., Asmus, H. und Asmus, R. (2015) Benthic mesocosms simulating future climate change scenarios in the field of marine ecology. [Vortrag] In: Mesocosmen Workshop - Akkeshi Marine Station. , 23.-24.04.2015, Akkeshi, Japan . Pansch, A., Asmus, H. und Asmus, R. (2015) Effects of global warming and ocean acidification and eutrophication on benthic communities in the German Wadden Sea – examined with mesiocosm experiments. [Vortrag] In: ECSA 55 - 55.Conference of Estuarine Coastal Sciences Association . , 06.-09.09.2015, London, UK . Pansch, A., Asmus, H. und Asmus, R. (2015) Effects of global warming, ocean acidification and eutrophication on benthic communities in the German Wadden Sea - examined with mesocosm experiments. [Vortrag] In: ECSA 55 - 55.Conference of Estuarine Coastal Sciences Association . , 06.-09.09.2015, London, UK . Paul, C., Matthiessen, B. und Sommer, U. (2015) Warming and enhanced CO2 affect phytoplankton summer blooms in the Baltic Sea. [Vortrag] In: ASLO Aquatic Sciences Meeting 2015. , 22.-27.02.2015, Granada, Spain . Pondorfer, A. (2015) Gender differences in risk preferences and stereotypes: Experimental evidence from a matrilineal and a patrilineal society. [Vortrag] In: 3. Annual PhD Workshop - Experimental Development Economics: Lab in the Field. , 25.04.2015, London, UK . Rehdanz, K. (2015) Forum "Mensch, Ressourcennutzung & Governance". [Anderer] In: KDM Symposium "Küste 2025". , 15.-17.04.2015, Hamburg, Germany . Schalkhaußer, B., Bock, B., Pörtner, H. O. und Lannig, G. (2015) Easy prey? – Great scallop escape performance under ocean warming and acidification. [Vortrag] In: 20. International Pectinid Workshop. , 22.-28.04.2015, Galway, Ireland . Stapp, L., Bock, C., Pörtner, H. O. und Lannig, G. (2015) Adaptation and metabolic constraints of bivalves to ocean acidification. [Vortrag] In: BIOACID II Final Meeting. , 06.-07.10.2015, Kiel, Germany . Stiasny, M. H. , Mittermayr, A., Sswat, M. , Voss, R., Jutfelt, F., Chierici, M., Puvanendran, V., Mortensen, A., Reusch, T. B. H. und Clemmesen, C. (2015) Effects of end-of-the-century ocean acidification on Atlantic cod larvae of different populations in terms of survival, growth and recruitment to the fished stocks. [Vortrag] In: ICES Annual Science Conference 2015. , 21.-25.09.2015, Copenhagen, Denmark . Tonkes, H. und Hildebrandt, N. (2015) Impact of elevated pCO2 and temperature on energy balance and acid-base regulation of Arctic calanoid copepods. [Vortrag] In: Bioacid II Modelling Workshop. , 03.2015, Bremen, Germany . Tonkes, H., Niehoff, B., Freese, D. und Sartoris, F. H. (2015) Influence of pCO2, temperature, and feeding on the extracellular pH of Calanus glacialis during diapause. [Vortrag] In: ASLO Aquatic Sciences Meeting 2015. , 22.-27.02.2015, Granada, Spain . Zark, M., Riebesell, U. und Dittmar, T. (2015) Effects of ocean acidification on formation and turnover of DOM in a Swedish Fjord. [Vortrag] In: ASLO Aquatic Sciences Meeting 2015. , 22.-27.02.2015, Granada, Spain . Endres, S. , Galgani, L., Riebesell, U. , Schulz, K. G. und Engel, A. (2014) Do bacteria thrive when the ocean acidifies? Results from an off-­shore mesocosm study. [Vortrag] In: IMBER Open Science Conference FUTURE OCEAN. , 23.-27.06.2014, Bergen, Norway . Al-Janabi, B., Asmus, R., Asmus, H., Bartsch, I., Böhm, F., Böttcher, M., Eisenhauer, A. , Graiff, A., Gutow, L., Karsten, U., Kruse, I., Matthiessen, B., Mensch, B., Pansch, A., Raddatz, S., Schmitz, R. A., Tauber, I., Wahl, M. , Werner, F. J. und Winde, V. (2014) Effects of climate change on benthic communities in the Baltic Sea – Kiel Benthocosms. [Vortrag] In: Akkeshi Marine Station, University of Hokkaido. , 24.10.2014, Hokkaido, Japan . Al-Janabi, B., Graiff, A., Karsten, U., Wahl, M. und Kruse, I. (2014) Response of genetic diversity levels of early life-stage Fucus vesiculosus on two climate change parameters. [Vortrag] In: 15. Scientific Conference of the Phycology Section of the German Botanical Society, Stralsund. , 23.-26.02.2014, Stralsund, Germany . Boxhammer, T. , Bach, L. T. , Czerny, J., Hildebrandt, N., Schulz, K. G. und Riebesell, U. (2014) Vertical particle flux in acidifying oceans – Impact on future ocean carbon export potential. [Vortrag] In: SOPRAN Annual Meeting 2014. , 25.-26.03.2014, Bremen, Germany . Clemmesen, C. (2014) Effects of Ocean Acidification on larval fish. [Eingeladener Vortrag] In: Helgoland Seminar Series. , 08.01.2014, Helgoland, Germany . Clemmesen, C. (2014) Effects of Ocean Acidification on larval fish. [Eingeladener Vortrag] In: Centre for Environment, Fisheries & Aquaculture Science (CEFAS). , 07.10.2014, Lowestoft, UK . Clemmesen, C. , Maneja, R., Stiasny, M. , Frommel, A., Folkvord, A., Piatkowski, U. und Geffen, A. (2014) Effects of ocean acidification on otolith growth and size selective mortality of larval Atlantic cod (Gadus morhua). [Vortrag] In: 5. International Otolith Conference. , 20.-24.10..2014, Mallorca, Spain . Clemmesen, C. , Stiasny, M. und Sswat, M. (2014) Ocean Acidification and Warming affect survival and growth of Atlantic cod (Gadus morhua ) larvae –comparison of experimental data. [Vortrag] In: 144. Annual Meeting of the American Fisheries Society. , 19.08.2014, Quebec, Canada . Endres, S. , Galgani, L., Riebesell, U. , Schulz, K. G. und Engel, A. (2014) Stimulated Bacterial Growth under Elevated pCO2: Results from an Off-Shore Mesocosm Study. [Vortrag] In: BIOACID Annual Meeting 2014. , 10-11.09.2014, Kiel, Germany . Fink, A., Lichtschlag, A. und de Beer, D. (2014) Study of microbial processes in sediments across natural pH gradients. [Vortrag] In: Microsensor Workshop 1. , 28.04.-02.05.2014, AIMS, Townsville, Australia . Fink, A., Lichtschlag, A., Graziani, S., Fabricius, K. und de Beer, D. (2014) Sediment biogeochemistry along a natural pH/pCO2 gradient in a tropical coral reef (Normanby Island, Papua-New Guinea). [Vortrag] In: BIOACID Annual Meeting 2014. , 10-11.09.2014, Kiel, Germany . Garzke, J., Paul, C., Ismar, S. und Sommer, U. (2014) Multi-stressor responses of plankton communities in two indoor mesocosm experiments. [Vortrag] In: BIOACID Annual Meeting 2014. , 10-11.09.2014, Kiel, Germany . Horn, H. G. (2014) Effects of ocean acidification and warming on microzooplankton communities. [Vortrag] In: POLMAR Seminar. , 23.08.2014, Mariaspring, Germany . Koeve, W. (2014) Detecting the imprint of biogeochemical processes for skill assessment of global ocean biogeochemical models. [Vortrag] In: BIOACID Annual Meeting 2014. , 10-11.09.2014, Kiel, Germany . Koeve, W. und Kähler, P. (2014) The puzzle of oceanic oxygen utilization. [Vortrag] In: EGU General Assembly 2014. , 27.04.-02.05.2014, Vienna, Austria . Kunz, K. L. (2014) Energy budget studies under OAW scenarios. [Vortrag] In: Integrative Ecophysiology Seminar. , 20.05.2014, AWI, Bremen, Germany . Kunz, K. L. (2014) Growth and food consumption under OAW: A comparison between Polar cod and Atlantic cod. [Vortrag] In: Integrative Ecophysiology Symposium. , 15.12.2014, AWI, Bremen, Germany . Lange, J. A. F., Schwenk, K. und Boersma, M. (2014) Ozeanversauerung und Evolution: eine experimentelle Analyse. [Vortrag] In: PhD-Day. , 05.2014, Helgoland, Germany . Lange, J., Boersma, M. und Schwenk, K. (2014) Mesozooplankton's adaptations to ocean acidification. [Vortrag] In: PhD-Days AWI. , 05.-08.05.2014, Helgoland, Germany . Lannig, G. (2014) Comparative cellular physiology of marine organisms. [Vortrag] In: BMB Symposium Universität Bremen. , 31.01.2014, Bremen, Germany . Lannig, G. (2014) Impact of environmental parameters on energy metabolism of marine ectotherms: Linking cellular response and organism performance. [Vortrag] In: Seminar Integrative Ökophysiologie. , 03.06.2014, AWI, Bremen, Germany . Lannig, G. (2014) Impact of hypoxia and hypoxemia on the physiology of marine ectotherms: how do animals cope with it?. [Vortrag] In: Ocean Sciences Colloquium, BreMarE Day, Universität Bremen. , 26.11.2014, Bremen, Germany . Lischka, S. , Graeve, M., Janssen, D. und Riebesell, U. (2014) Lipids of Arctic pteropods: evidence for changes in lipid class and fatty acid compositions under ocean acidification and warming?. [Vortrag] In: BIOACID Annual Meeting 2014. , 10-11.09.2014, Kiel, Germany . Mark, F. C. (2014) Fit For The Future: Mitochondrial Plasticity Forms The Basis For Aerobic Performance In A Changing Climate. [Vortrag] In: 11. Congress on the Biology of Fish. , 03.-08.08.2014, Edinburgh, UK . Mark, F. C. (2014) Vorträge und Radiointerviews über BIOACID II während des FS Heincke Tag des offenen Schiffs. [Vortrag f.d. Öffentlichkeit] In: European Maritime Day. , 18.05.2014, Bremen, Germany . Mark, F. C. (2014) When the going gets hot & sour - can mitochondria set the cellular basis for acclimation in a changing ocean?. [Vortrag] In: DZG annual meeting . , 11.-14.09.2014, Göttingen, Germany . Pansch, A., Asmus, H. und Asmus, R. (2014) Marine benthic mesocosms - A facility for climate change research at the ecosystem level. [Vortrag] In: REEPON-Workshop. , 26.05.2014, Bremerhaven, Germany . Pansch, A., Asmus, H. und Asmus, R. (2014) Marine benthic mesocosms - A facility for climate change research at the ecosystem level. [Vortrag] In: Aqualife 2014. , 03.-04.06.2014, Kiel, Germany . Pansch, A., Asmus, H. und Asmus, R. (2014) The effect of global warming and CO2 increase on a Fucus vesiculosus community of the Wadden Sea, a mesocosm approach. [Vortrag] In: INFOWEB - Annual Meeting - Bilateral Wadden Sea Research. , 30.09.-01.10.2014, AWI, Sylt, Germany . Pansch, A., Asmus, H., Asmus, R., Mensch, B., Winde, V. und Wahl, M. (2014) Effects of global warming and ocean acidification on benthic communities in the German Wadden Sea - examined with mesocosm experiments. [Vortrag] In: BIOACID Annual Meeting 2014. , 10-11.09.2014, Kiel, Germany . Paul, C., Matthiessen, B. und Sommer, U. (2014) Warming but not enhanced CO2 quantitatively and qualitatively affects phytoplankton biomass. [Vortrag] In: 15. Scientific Conference of the Phycology Section of the German Botanical Society, Stralsund. , 23.-26.02.2014, Stralsund, Germany . Pondorfer, A. (2014) Gender differences in risk preferences and stereotypes: Experimental evidence from a matrilineal and a patrilineal society. [Vortrag] In: FUR 2014 - 16. Conference on the Foundations of Utility and Risk. , 30.06.-02.07.2014, Rotterdam, Netherlands . Pondorfer, A. (2014) Gender differences in risk preferences and stereotypes: Experimental evidence from a matrilineal and a patrilineal society. [Vortrag] In: ASFEE 2014 - 5. Annual Meeting of the French Experimental Economics Association. , 22.-23.05.2014, Besancon, France . Pondorfer, A. (2014) Gender differences in risk preferences and stereotypes: Experimental evidence from a matrilineal and a patrilineal society. [Vortrag] In: 4. ACCER Workshop on Cross-Cultural Experimental Economics Research. , 23-24.05.2014, Duisburg, Germany . Rehdanz, K. (2014) Governance des Ozeans: Wem gehört das Meer und wie wird es regiert?. [Vortrag] In: Lecture Series "Ocean Sustainability: Ozean im Wandel - Herausforderungen für die Zukunft" - Future Ocean. , 11.11.2014, Kiel, Germany . Sommer, U., Paul, C. und Moustaka-Gouni, M. (2014) Phytoplankton response to warming and CO2 increase during an indoor mesocosm experiment. [Vortrag] In: 15. Scientific Conference of the Phycology Section of the German Botanical Society, Stralsund. , 23.-26.02.2014, Stralsund, Germany . Stapp, L. S., Thomsen, J., Melzner, F., Schade, H., Bock, C., Pörtner, H. O. und Lannig, G. (2014) Ocean acidification sensitivity of the Baltic blue mussel – a comparative study between sensitive and tolerant families. [Vortrag] In: PhD-Days AWI. , 05.-08.05.2014, Helgoland, Germany . Stapp, L. S., Thomsen, J., Melzner, F., Schade, H., Bock, C., Pörtner, H. O. und Lannig, G. (2014) Ocean acidification sensitivity of the Baltic blue mussel – variable phenotypic responses within a population. [Vortrag] In: Annual Meeting of the Society for Experimental Biology. , 01.-04.07.2014, Manchester, UK . Stapp, L. S., Thomsen, J., Melzner, F., Schade, H., Bock, C., Pörtner, H. O. und Lannig, G. (2014) Variable phenotypic response of Baltic blue mussel (Mytilus edulis) to ocean acidification: integrating cellular response and organism performance. [Vortrag] In: BIOACID Annual Meeting 2014. , 10-11.09.2014, Kiel, Germany . Tonkes, H., Niehoff, B., Freese, D. und Sartoris, F. J. (2014) Regulation of extracellular pH in Calanus glacialis during diapause. [Vortrag] In: APECS Netherlands Symposium. , 04.11.2014, Groningen, The Netherlands . Tonkes, H., Niehoff, B., Freese, D. und Sartoris, F. J. (2014) Regulation of pHe and haemolymph cation concentrations in Calanus glacialis during diapause: do elevated pCO2 and temperature matter?. [Vortrag] In: BIOACID Annual Meeting 2014. , 10-11.09.2014, Kiel, Germany . Tonkes, H., Sartoris, F. J. und Niehoff, B. (2014) Arctic copepods in transition from diapause to activity – do temperature, CO2, and food matter?. [Vortrag] In: PhD-Day. , 05.2014, Helgoland, Germany . Wirtz, K. (2014) Long-term ecological dynamics guarded by adaptive and ontogenetic structural shifts. [Eingeladener Vortrag] In: CREST Conference. , 10.2014, Tokyo, Japan . Wirtz, K. (2014) One way to grow, but many ways to die: a mechanistic approach to explain plankton dynamics. [Eingeladener Vortrag] In: Kellogs-Biological-Station Institute Seminar. , 09.2014, Hickory Corners, Mich., USA . Wirtz, K. (2014) What is this rhythm? Plankton food-webs re-played by mechanistic and trait-based models. [Eingeladener Vortrag] In: IMCONet Workshop on Food Web Modelling . , 24.-26.06.2014, Gent, Belgium . Aberle, N. (2013) Pathways through the plankton: the impact of external drivers on lower food-web dynamics. [Vortrag] In: GEOMAR (Sektion Meereswissenschaften). , 17.12.2013, Kiel, Germany . Aberle, N. (2013) Pathways through the plankton: the impact of external drivers on lower food-web dynamics. [Vortrag] In: IGB Leibniz-Institut für Gewässerӧkologie und Binnenfischerei. , 18.12.2013, Stechlinsee, Germany . Aberle, N. (2013) The impact of climate change on low and high latitude marine ecosystems. [Vortrag] In: Sultan Qaboos University. , 22.05.2013, Muscat, Sultan Oman . Clemmesen, C. , Frommel, A., Maneja, R. und Piatkowski, U. (2013) Effects of Ocean Acidification on herring and cod larvae – a comparative approach. [Vortrag] In: 37. Annual Larval Fish Conference. , 02.-06.06.2013, Miami, USA . Garzke, J., Paul, C. und Sommer, U. (2013) Temperature and CO2 changes affect quality and quantity of the planktonic food web. [Vortrag] In: BIOACID Annual Meeting 2013. , 01.-02.10.2013, Rostock-Warnemünde, Germany . Hassenrück, C., Fabricius, K., Boetius, A. und Ramette, A. (2013) Effect of ocean acidification on biofilm formation on tropical coral reefs. [Vortrag] In: YouMaRes 4.0. , 11.-13.09.2013, Oldenburg, Germany . Hassenrück, C., Hofmann, L., Fabricius, K., Bischof, K. und Ramette, A. (2013) The effect of ocean acidification on microbial biofilms on tropical coral reefs at natural CO2 vents in Papua New Guinea (BIOACID WP 3.2). [Vortrag] In: BIOACID Annual Meeting 2013. , 01.-02.10.2013, Rostock-Warnemünde, Germany . Koeve, W. (2013) The need for data based evaluation of biogeochemical models in ocean acidification research. [Vortrag] In: BIOACID Workshop Consortium 5 "Ocean Services". , 05.04.2013, Kiel . Kunz, K. L. (2013) Energy budget, growth and exercises as indicators for performance and fitness capacity. [Vortrag] In: POLMAR, PhD Days. , 03.-06.06.2013, AWI, Bremen, Germany . Lange, J. A. F., Schwenk, K. und Boersma, M. (2013) Ozean Versauerung übt einen Selektionsdruck auf Zooplankton Organismen aus. [Vortrag] In: Bioacid II Data Workshop. , 2013, Kiel, Germany . Lange, J. A. F., Schwenk, K. und Boersma, M. (2013) Ozeanversauerung und Evolution: eine experimentelle Analyse. [Vortrag] In: Biologisches Kolloquium Universität Koblenz. , 2013, Koblenz-Landau, Germany . Lannig, G. (2013) Coping with a changing ocean: Physiological responses to environmental factors in marine organisms. [Vortrag] In: Seminar, Institute for Hydrobiology and Fisheries Science (IHF). , 18.01.2013, Hamburg, Germany . Lohbeck, K. T. (2013) Potential and Constraints of Evolutionary Adaptation to Ocean Acidification. [Vortrag] In: BIOACID Annual Meeting 2013. , 01.-02.10.2013, Rostock-Warnemünde, Germany . Lohbeck, K. T., Riebesell, U. , Collins, S. und Reusch, T. B. H. (2013) Potential and constraints of adaptation to ocean acidification in the globally important marine phytoplankton species Emiliania huxleyi. [Vortrag] In: 14. Congress of the European Society for Evolutionary Biology - ESEB 2013. , 19.-24.08.2013, Lisbon, Portugal . Mark, F. C. (2013) Integrative Cell Biology in Times of Climate Change. [Vortrag] In: Marine Biology Seminar. , 15.04.2013, TAMUG, Galveston, USA . Mark, F. C. (2013) Metabolic shifts involved in the response to ocean acidification and warming in fish. [Eingeladener Vortrag] In: Conservation Physiology of Marine Fishes, SEB Annual Meeting. , 05.-06.07.2013, Valencia, Spain . Mark, F. C. (2013) Schwimmen in saurerem Wasser. [Vortrag] In: Odyssee Klima. , 15.06.2013, Bremerhaven, Germany . Moreno de Castro, M. (2013) Separating direct acidification response signal from variability in plankton dynamics. [Vortrag] In: Understanding and Interpreting Uncertainty - Interdisziplinary Conference of Young Earth System Scientists. , 22.-25.09.2013, Hamburg, Germany . Moreno de Castro, M. (2013) Uncertainties in models for ocean acidification. [Vortrag] In: 1. Workshop on Trait-based approaches to Ocean Life. , 26.-28.08.2013, Kopenhagen, Danmark . Rehdanz, K. (2013) Socio-economic impacts of ocean acidification. [Vortrag] In: UNFCCC's Subsidiary Body on Scientific and Technological Advice (SBSTA). , 24.-25.10.2013, Bonn, Germany . Schmidt, M., Storch, D., Bock, C., Gerlach, G., Munday, P. L. und Pörtner, H. O. (2013) Behavioural changes in response to temperature and CO2 in polar cod. [Vortrag] In: YouMaRes 4.0. , 11.-13.09.2013, Oldenburg, Germany . Sswat, M. , Clemmesen, C. , Jutfeldt, F. und Riebesell, U. (2013) Impact of ocean acidification and warming on larvae of commercially important fish species. [Vortrag] In: 37. Annual Larval Fish Conference. , 02.-06.06.2013, Miami, USA . Sswat, M. , Stiasny, M. , Riebesell, U. und Clemmesen, C. (2013) Impact of Ocean Acidification and Warming on larvae of commercially important fish species. [Vortrag] In: BIOACID Annual Meeting 2013. , 01.-02.10.2013, Rostock-Warnemünde, Germany . Stapp, L. S., Thomsen, J., Melzner, F., Schade, H., Bock, C., Pörtner, H. O. und Lannig, G. (2013) WP 3.7: Adaptation and metabolic constraints of bivalve reefs to future climate change: Comparison between bivalve reefs from natural CO2 sites. [Vortrag] In: BIOACID II Annual Meeting. , 01.-02.10.2013, Warnemünde, Germany . Tonkes, H., Niehoff, B. und Sartoris, F. J. (2013) Arctic copepods in a lower pH ocean. [Vortrag] In: PHD-Day, University of Potsdam. , 05.2013, Potsdam, Germany . Werner, F. J. und Matthiessen, B. (2013) Restructuring of microbial communities under climate change: first results of benthocosm and lab experiments. [Vortrag] In: BIOACID Annual Meeting 2013. , 01.-02.10.2013, Rostock-Warnemünde, Germany . Wirtz, K. (2013) Are the many services provided by marine ecosystems all for free?. [Eingeladener Vortrag] In: International Youth Climate Change Summer Camp. , 08.2013, Qingdao, China . Wirtz, K. (2013) Before we can walk … A mechanistic understanding by trait-based model development. [Eingeladener Vortrag] In: 1. Workshop on Trait-based approaches to Ocean Life. , 26.-28.08.2013, Kopenhagen, Danmark . Wirtz, K. (2013) Separating phytoplankton intrinsic variability from their response to acidification using Adaptive Trait-Based dynamics. [Eingeladener Vortrag] In: Innovative Approaches in Marine Environment Modelling. , 19.-23.08.2013, Brest, France . Bögner, D., Bickmeyer, U., Rödel, H. G. und Köhler, A. (2012) Effect of Ocean Acidification on Fertilization Success of an Arctic Sea Urchin Species, Strongylocentrotus droebachiensis. [Vortrag] In: 3. Symposium on the Ocean in a High-CO2 World. , 24.-27.09.2012, Monterey, USA . Frommel, A., Maneja, R., Lowe, D., Geffen, A. J., Folkvord, A., Piatkowski, U. und Clemmesen, C. (2012) Effects of ocean acidification on the growth and organ health of Atlantic herring larvae. [Vortrag] In: 3. Symposium on the Ocean in a High-CO2 World. , 24.-27.09.2012, Monterey, USA . Hauck, J., Arrigo, K. R., Hoppema, M., van Dijken, G. L., Völker, C. und Wolf-Gladrow, D. (2012) Dissolution of Antarctic shelf carbonates: an insignificant feedback to acidification. [Vortrag] In: EGU General Assembly 2012. , 22.-27.04.2012, Vienna, Austria . Hauck, J., Völker, C., Wang, T., Hoppema, M., Losch, M. und Wolf-Gladrow, D. A. (2012) The Southern Ocean in a high-CO2 world: Changes in inorganic and organic carbon fluxes. [Vortrag] In: 3. International Symposium on The Ocean in a high-CO2 World. , 24.-27.09.2012, Monterey, USA . Hauck, J., Völker, C., Wang, T., Losch, M., Wolf-Gladrow, D. A. und Hoppema, M. (2012) Southern Ocean response to the Annular Mode: Inorganic and organic carbon fluxes. [Vortrag] In: Climate Change in High Latitudes, 10-Years Anniversary Conference. , 03.-06.09.2012, Bergen, Norway . Horn, H. G. und Aberle, N. (2012) BIOACID II WP 1.6: The role of microzooplankton under future ocean acidification and warming scenarios. [Vortrag] In: BAH Seminar. , 20.10.2012, Helgoland, Germany . Koeve, W. und Oschlies, A. (2012) BIOACID I, Theme 5 Overview, Integrated assessment, sensitivity and uncertainties. [Vortrag] In: BIOACID II Kickoff-Meeting. , 06.-07.11.2012, Kiel, Germany . Koeve, W. , Duteil, O. , Wagner, H. und Oschlies, A. (2012) Evaluating global biogeochemical models for ocean acidification and climate change research. [Vortrag] In: BIOACID II Kickoff-Meeting. , 06.-07.11.2012, Kiel, Germany . Lannig, G., Schalkhausser, B. und Bock, C. (2012) Impact of ocean warming and acidification on performance of scallops – a latitudinal comparison. [Vortrag] In: 3. International Symposium on The Ocean in a high-CO2 World. , 24.-27.09.2012, Monterey, USA . Mark, F. C. (2012) Ocean Warming and Acidification – when fish mitochondria turn sour. [Vortrag] In: Bioblast 2012. , 10.-12.12.2012, Innsbruck, Austria . Piatkowski, U. (2012) Natural and anthropogenic factors that characterize environment, life cycle and biology of cephalopods. [Eingeladener Vortrag] In: Cephalopod International Advisory Council Symposium 2012. , 27.10.-02.11.2012, Florianopolis, Brazil . Schwichtenberg, F., Pätsch, J., Lorkowski, I., Amann, T., Schartau, M. , Thomas, H., Winde, V., Dellwig, O., van Beusekom, J. E. E. und Böttcher, M. (2012) Impact of internal and external alkalinity fluxes on the carbonate system of the larger German Bight. [Vortrag] In: EGU General Assembly 2012. , 22.-27.04.2012, Vienna, Austria . Stapp, L. S., Thomsen, J., Melzner, F., Schade, H., Bock, C., Pörtner, H. O. und Lannig, G. (2012) WP 3.7: Adaptation and metabolic constraints of bivalve reefs to future climate change: Comparison between bivalve reefs from natural CO2 sites. [Vortrag] In: BIOACID II Kickoff-Meeting. , 06.-07.11.2012, Kiel, Germany . Stapp, L., Lannig, G., Bock, C., Beckmann, M. und Pörtner, H. O. (2012) Cellular response to changing environmental parameters. [Vortrag] In: Evolutionary potential in marine populations. , 17.-21.09.2012, List, Germany . Bögner, D., Bickmeyer, U. und Köhler, A. (2011) Effect of Ocean Acidification on Fertilization Success of Strongylocentrotus droebachiensis. [Vortrag] In: Effect of Ocean Acidification on Fertilization Success of Strongylocentrotus droebachiensis Workshop. , 24.-26.11.2011, Xanten, Germany . Bögner, D., Bickmeyer, U. und Köhler, A. (2011) Impact of ocean acidification exposure on the fertilization success of Strongylocentrotus droebachiensis. [Vortrag] In: BIOACID Annual Meeting 2011. , 26.-30.09.2011, Bremen, Germany . Clemmesen, C. , Frommel, A., Maneja, R., Geffen, A., Folkvord, A., Lowe, D., Malzahn, A. und Piatkowski, U. (2011) Ocean Acidification effects on commercially important fish species. [Vortrag] In: 2. Annual Meeting of BIOACID. , 26.-30.09.2011, Bremen, Germany . Endres, S., Unger, J., Wannicke, N., Nausch, M., Voss, M. und Engel, A. (2011) Impact of ocean acidification on microbial degradation of organic matter. [Vortrag] In: BIOACID Annual Meeting 2011. , 26.-30.09.2011, Bremen, Germany . Hauck, J., Gerdes, D. A., Hillenbrand, C. D., Hoppema, M., Kuhn, G., Nehrke, G., Völker, C. und Wolf-Gladrow, D. A. (2011) Carbonate sediments on Antarctic shelves and implications for a mechanism to buffer ocean acidification in the Southern Ocean. 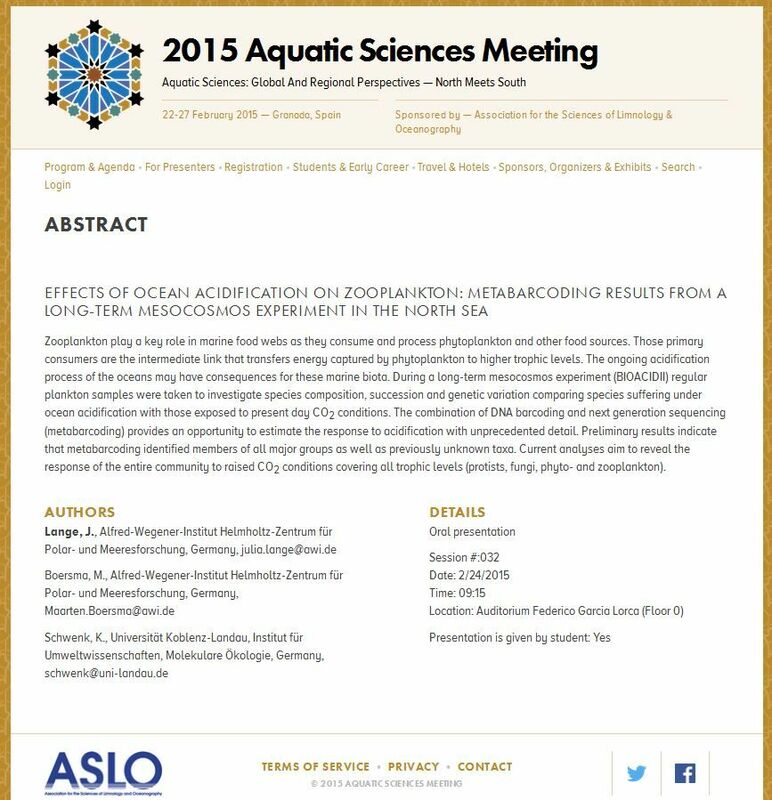 [Vortrag] In: ASLO Aquatic Sciences Meeting. , 13.-18.02.2011, San Juan, Puerto Rico, USA . Hauck, J., Gerdes, D. A., Hillenbrand, C. D., Hoppema, M., Kuhn, G., Nehrke, G., Völker, C. und Wolf-Gladrow, D. A. (2011) Distribution and mineralogy of carbonate sediments on Antarctic shelves. [Vortrag] In: 2. Young Scientist Excellence Cluster Conference on Marine and Climate Research. , 04.-05..10.2011, Bremen, Germany . Hauck, J., Gerdes, D. A., Hillenbrand, C. D., Hoppema, M., Kuhn, G., Nehrke, G., Völker, C. und Wolf-Gladrow, D. A. (2011) Distribution and mineralogy of carbonate sediments on Antarctic shelves. [Vortrag] In: BIOACID Annual Meeting 2011. , 26.-30.09.2011, Bremen, Germany . Hildebrandt, N., Niehoff, B. und Sartoris, F. J. (2011) The response of dominant Arctic copepod species to elevated CO2 concentrations - Results from respiration and carbon and nitrogen measurements. [Vortrag] In: BIOACID Annual Meeting 2011. , 26.-30.09.2011, Bremen, Germany . Meyerhöfer, M. (2011) Presentation of the German project BIOACID (Biological Impacts of Ocean ACIDification). [Eingeladener Vortrag] In: UK Ocean Acidification Research Programme: First Annual Science Meeting. , 06.-07.01.2011, Cambridge, UK . Ragazzola, F., Form, A., Foster, L., Büscher, J., Hansteen, T. H. und Fietzke, J. (2011) Response of coralline alga Lithothamnion glaciale Kjellman to ocean acidification. [Eingeladener Vortrag] In: 2. BIOACID Annual Meeting. , 26.-30.09.2011, Bremen, Germany . Ragazzola, F., Form, A., Foster, L., Büscher, J., Hansteen, T. H. und Fietzke, J. (2011) Response of coralline alga Lithothamnion glaciale Kjellman to ocean acidification. [Eingeladener Vortrag] In: Goldschmidt Conference 2011. , 14.-19.08.2011, Prague, Czech Republic . Schwichtenberg, F., Pätsch, J., Lorkowski, I., Schartau, M. , Thomas, H., Winde, V., Dellwig, O., van Beusekom, J. E. E. und Böttcher, M. (2011) Impact of alkalinity fluxes on the carbon cycle in the southern North Sea. [Vortrag] In: YOUMARES 2.0 - Ocean amidst science, innovation and society. , 07.-09.09.2011, Bremerhaven, Germany . Schwichtenberg, F., Pätsch, J., Lorkowski, I., Schartau, M. , Thomas, H., Winde, V., Dellwig, O., van Beusekom, J. E. E. und Böttcher, M. (2011) Impact of alkalinity fluxes on the carbon cycle in the southern North Sea. [Vortrag] In: BIOACID Annual Meeting 2011. , 26.-30.09.2011, Bremen, Germany . Schwichtenberg, F., Pätsch, J., Lorkowski, I., Schartau, M. , Thomas, H., Winde, V., Dellwig, O., van Beusekom, J. E. E. und Böttcher, M. (2011) Impact of alkalinity fluxes on the carbon cycle in the southern North Sea between 1977 and 2006. [Vortrag] In: EGU General Assembly 2011. , 03.-08.04.2011, Vienna, Austria . Unger, J., Wannicke, N., Voss, M., Endres, S. , Engel, A. , Nausch, G. und Nausch, M. (2011) Impact of pCO2 on P-pool changes under varying phytoplankton/bacteria ratios. [Vortrag] In: BIOACID Annual Meeting 2011. , 26.-30.09.2011, Bremen, Germany . Wannicke, N., Unger, J., Endres, S. , Nausch, M., Salka, I., Engel, A. , Grossart, H. P. und Voss, M. (2011) Oceans turning sour - will it directly affect growth and production of heterotrophic bacteria? - What we have learned so far from laboratory to mesocosm experiments. [Vortrag] In: 2. Annual Meeting of BIOACID. , 26.-30.09.2011, Bremen, Germany . Hauck, J., Hillenbrand, C. D., Hoppema, M., Kuhn, G., Nehrke, G., Völker, C. und Wolf-Gladrow, D. (2010) Buffering ocean acidification: Dissolution of carbonate sediments in the Southern Ocean. [Vortrag] In: BIOACID / EPOCA / UKOARP Meeting. , 30.09.2010, Bremerhaven, Germany . Fink, A., Hassenrück, C., Guilini, K., Lichtschlag, A., Borisov, S., Fabricius, K. und de Beer, D. (2016) Century-long acidification reveals possible consequences of coral reef sediment dissolution. [Poster] In: Ocean Sciences Meeting 2016. , 21.-26.02.2016, New Orleans, USA . Kunz, K. L., Claireaux, G., Knust, R., Pörtner, H. O. und Mark, F. C. (2016) The physiology of polar cod (Boreogadus saida) in a changing world: Impacts of ocean acidification and warming. [Poster] In: 4. International Symposium on the Ocean in a High-CO2 World. , 03.-06.05.2016, Hobart, Tasmania . Bergen, B., Endres, S. , Engel, A. , Zark, M., Dittmar, T., Sommer, U. und Jürgens, K. (2015) Effect of acidification and warming on planktonic bacterial communities during two seasonal phytoplankton bloom mesocosms. [Poster] In: SAME14 - ﻿Symposium on Aquatic Microbial Ecology. , 23.-28.08.2015, Uppsala, Sweden . Hassenrück, C., Fink, A., Lichtschlag, A., Tegetmeyer, H., de Beer, D. und Ramette, A. (2015) Biogeochemical and microbial characterization of naturally CO2-rich reef sediments as in-situ laboratories for ocean acidification research. [Poster] In: SAME124- 14. ﻿Symposium on Aquatic Microbial Ecology. , 23.-28.08.2015, Uppsala, Sweden . Hassenrück, C., Fink, A., Lichtschlag, A., Tegetmeyer, H., de Beer, D. und Ramette, A. (2015) Biogeochemical and microbial characterization of naturally CO2-rich reef sediments as in-situ laboratories for ocean acidification research. [Poster] In: BIOACID II Final Meeting. , 06.-07.10.2015, Kiel, Germany . Hildebrandt, N., Thomisch, K. und Niehoff, B. (2015) Mesozooplankton abundance and distribution in Fram Strait in comparison between a cold and a warm year. [Poster] In: ASLO Aquatic Sciences Meeting 2015. , 22.-27.02.2015, Granada, Spain . Horn, H. G., Sander, N., Alguero-Muniz, M., Löder, M. G. J., Boersma, M. und Aberle, N. (2015) Ocean acidification and global warming: can we expect effects on the microzooplankton communities?. [Poster] In: BIOACID II Final Meeting. , 06.10.2015, Kiel, Germany . Kunz, K. L., Claireaux, G., Knust, R., Pörtner, H. O. und Mark, F. C. (2015) Aerobic performance of Polar cod (Boreogadus saida) under ocean acidification and warming conditions. [Poster] In: SEB Conference. , 29.06.-03.07.2015, Prague, Czech Republic . Kunz, K. L., Knust, R. und Mark, F. C. (2015) Growth and food consumption of Polar and Atlantic cod under ocean acidification and warming scenarios. [Poster] In: Arctic Frontiers Conference. , 19.-23.01.2015, Tromso, Norway . Kunz, K. L., Pörtner, H. O., Knust, R. und Mark, F. C. (2015) Competitive strengths of Polar cod (Boreogadus saida) and Atlantic cod (Gadus morhua) under ocean acidification and warming scenarios. [Poster] In: BIOACID II Final Meeting. , 06.-07.10.2015, Kiel, Germany . Langer, J. A. F., Sharma, R., Schmidt, S., Thines, M., Schwenk, K. und Boersma, M. (2015) Effects of ocean acidification on zooplankton: Metabarcoding results from a mesocosmos experiment. [Poster] In: BIOACID II Final Meeting. , 06.-07.10.2015, Kiel, Germany . Leo, E., Storch, D., Pörtner, H. O. und Mark, F. C. (2015) Heart metabolism of two gadoid fish species at their distribution boundary under elevated temperature and PCO2. [Poster] In: SEB Conference. , 29.06.-03.07.2015, Prague, Czech Republic . Leo, E., Storch, D., Pörtner, H. O. und Mark, F. C. (2015) WP: 4.2 Effects of Ocean Acidification and Warming on the functioning of fish heart mitochondria. [Poster] In: BIOACID II Final Meeting. , 06.-07.10.2015, Kiel, Germany . Matthiessen, B., Werner, F. J. und Graiff, A. (2015) Temperature threshold explains disruption of Fucus-sustaining top-down control. [Poster] In: ASLO Aquatic Sciences Meeting 2015. , 22.-27.02.2015, Granada, Spain . Sander, N., Horn, H. G., Boersma, M. und Aberle, N. (2015) Microzooplankton as a trophic upgrader in a high CO2 ocean: evidence from a small-scale experiment. [Poster] In: European Marine Biology Symposium (EMBS) 2015. , 21.-25.09.2015, Helgoland, Germany . Tonkes, H., Sartoris, F. J. und Niehoff, B. (2015) Direct and indirect effects of ocean acidification and warming on Calanus spp. (Copepoda) during critical life phases. [Poster] In: BIOACID Annual Meeting 2015. , 06.10.2015, Kiel, Germany . Wagner, H., Koeve, W. , Kriest, I. und Oschlies, A. (2015) Sensitivity of simulated deep ocean natural radiocarbon to gas exchange velocity and historical atmospheric ∆14C variations . [Poster] In: EGU General Assembly 2015. , 12.–17.04.2015 , Vienna, Austria . Geophysical Research Abstracts, 17 (EGU2015-11423). Werner, F. J., Graiff, A. und Matthiessen, B. (2015) Temperature-induced disruption of top-down control impairs the Baltic Sea Fucus vesiculosus system during summer. [Poster] In: ASLO Aquatic Sciences Meeting 2015. , 22.-27.02.2015, Granada, Spain . Leo, E., Storch, D., Pörtner, H. O. und Mark, F. C. (2014) Effects of Ocean Acidification and Warming on the mitochondrial physiology of Atlantic cod. [Poster] In: 18. EBEC Conference. , 12.-17.07.2014, Lisbon, Portugal ; e26 . DOI 10.1016/j.bbabio.2014.05.294. Biochimica et Biophysica Acta (BBA) - Bioenergetics, 1837 (Supplement). Al-Janabi, B., Graiff, A., Karsten, U., Kruse, I. und Wahl, M. (2014) Does genetic diversity of F. vesiculosusgermlings confer resistance towards climate change stress?. [Poster] In: BIOACID Annual Meeting 2014. , 10-11.09.2014, Kiel, Germany . Arndt, C., Miest, J. J., Sommer, U. und Ueberschär, B. (2014) Effect of processed copepods as food source on fish larval performance. [Poster] In: Aquaculture Europe Conference. , 14.-17.10.2014, San Sebastian, Spain . Clemmesen, C. , Stiasny, M. und Sswat, M. (2014) Impact of ocean acidification and warming on cod larvae. [Poster] In: BIOACID Workshop Consortium 4 "Effects of ocean acidification in a warming climate on species interactions at distribution boundaries: mechanisms and consequences at ecosystem level". , 03.09.2014, Kiel, Germany . Endres, S. , Karthäuser, C. und Engel, A. (2014) Combined effects of temperature and CO2 on organic matter dynamics in the surface microlayer and consequences for air-sea gas exchange. [Poster] In: BIOACID Annual Meeting 2014. , 10-11.09.2014, Kiel, Germany . Hassenrück, C., Hofmann, L. C., Bischof, K. und Ramette, A. (2014) Bacterial and eukaryotic communities on seagrass leaves exposed to naturally occurring high pCO2 conditions. [Poster] In: BIOACID Annual Meeting 2014. , 10-11.09.2014, Kiel, Germany . Horn, H. G., Aberle, N., Löder, M. G. J. und Boersma, M. (2014) Effects of ocean acidification and warming on microzooplankton communities in North Sea and Baltic Sea. [Poster] In: BIOACID Annual Meeting 2014. , 10-11.09.2014, Kiel, Germany . Horn, H. G., Aberle, N., Löder, M. G. J. und Boersma, M. (2014) Small but important: Effects of ocean acidification and warming on microzooplankton communities. [Poster] In: PhD-Days AWI. , 05.-08.05.2014, Helgoland, Germany . Koenigstein, S. (2014) Modelling ocean acidification impacts on marine ecosystems and societies: Integrating experimental results and ecosystem service uses. [Poster] In: 2. International Ocean Research Conference. , 17.-21.11.2014, Barcelona, Spain . Koenigstein, S. und Gößling-Reisemann, S. (2014) A social-ecological model of climate change impacts on marine ecosystems: Integrating experimental results and ecosystem service uses. [Poster] In: IMBER Open Science Conference FUTURE OCEAN. , 23.-27.06.2014, Bergen, Norway . Kunz, K. L., Knust, R. und Mark, F. C. (2014) Effects of ocean acidification and warming on growth and food consumption of juvenile Polar cod, Boreogadus saida. [Poster] In: POLMAR, PhD Days. , 05.-08.05.2014, AWI, Bremen, Germany . Kunz, K. L., Knust, R. und Mark, F. C. (2014) Effects of ocean acidification and warming on growth and food consumption of juvenile Polar cod, Boreogadus saida. [Poster] In: ESSAS Annual Meeting. , 07.-11.04.2014, Copenhagen, Denmark . Kunz, K. L., Knust, R. und Mark, F. C. (2014) Effects of ocean acidification and warming on growth and food consumption of juvenile Polar cod, Boreogadus saida and Atlantic cod, Gadus morhua. [Poster] In: BIOACID Annual Meeting 2014. , 10-11.09.2014, Kiel, Germany . Kunz, K. L., Knust, R. und Mark, F. C. (2014) Growth and food consumption of Polar and Atlantic cod under ocean acidification and warming scenarios. [Poster] In: CeMEB advanced course. , 01.-07.12.2014, University of Gothenburg, Fiskebäckskil, Sweden . Lange, J., Boersma, M. und Schwenk, K. (2014) Evolutionary response to ocean acidification. [Poster] In: BIOACID Annual Meeting 2014. , 10-11.09.2014, Kiel, Germany . Leo, E., Storch, D., Pörtner, H. O. und Mark, F. C. (2014) WP 4.2: Mitochondrial response to OAW in Atlantic cod embryos. [Poster] In: BIOACID Annual Meeting 2014. , 10-11.09.2014, Kiel, Germany . Lohbeck, K. T., Riebesell, U. und Reusch, T. B. H. (2014) Gene expression changes in high CO2 adapted Emiliania huxleyi. [Poster] In: BIOACID Annual Meeting 2014. , 10-11.09.2014, Kiel, Germany . Paul, C., Matthiessen, B. und Sommer, U. (2014) Warming but not enhanced CO2 quantitatively and qualitatively affects phytoplankton biomass. [Poster] In: Joint Aquatic Sience Meeting (JASM). , 18.-23.05.2014, Portland, Oregon, USA . Werner, F. J. und Matthiessen, B. (2014) Seasonal CO2 and temperature effects on Fucus-associated epiphytes and mesograzers. [Poster] In: BIOACID Annual Meeting 2014. , 10-11.09.2014, Kiel, Germany . Al-Janabi, B., Graiff, A., Kruse, I., Wahl, M. , Karsten, U. und Käse, L. (2013) The role of genetic diversity levels on sensibility to global change in early life-stage macroalgae. [Poster] In: BIOACID Annual Meeting 2013. , 01.-02.10.2013, Rostock-Warnemünde, Germany . Al-Janabi, B., Kruse, I. und Wahl, M. (2013) Interaction between genetic diversity and climate change in seaweed germlings. [Poster] In: CeMEB course: Marine evolution under climate change. , 13.11.2013, Kristineberg, Sweden . Fink, A., Hassenrück, C., Lichtschlag, A., Glas, M., Graziani, S., Fabricius, K., Ramette, A. und de Beer, D. (2013) Temporal and spatial habitat characterization, sediment biogeochemistry and microbial community changes along a natural pH/pCO2 gradient in a tropical coral reef (WP 3.1). [Poster] In: BIOACID Annual Meeting 2013. , 01.-02.10.2013, Rostock-Warnemünde, Germany . Hauck, J., Völker, C., Wang, T., Hoppema, M., Losch, M. und Wolf-Gladrow, D. A. (2013) Response of carbon fluxes to the Southern Annular Mode: The role of export production and seasonality. [Poster] In: 45. International Liege Colloquium on Ocean Dynamics: The variability of primary production in the ocean: from the synoptic to the global scale. , 13.-17.05.2013, Liege, Belgium . Horn, H. G., Aberle, N., Löder, M. G. J. und Boersma, M. (2013) The role of microzooplankton under future ocean acidification and warming scenarios. [Poster] In: BIOACID Annual Meeting 2013. , 01.-02.10.2013, Rostock-Warnemünde, Germany . Koenigstein, S. und Gößling-Reisemann, S. (2013) Advancing towards an end-to-end model of the impacts of ocean acidification and warming on Arctic Ocean ecosystem services: from effects on individual organisms to stakeholder integration. [Poster] In: Arctic Ocean Acidification Conference. , 06.-08.05.2013, Bergen, Norway . Koeve, W. , Wagner, H. und Oschlies, A. (2013) Skill assessment of global biogeochemical models used in Ocean Acidification research - the importance of correctly evaluating age distribution in ocean models (BIOACID project 5.1). [Poster] In: BIOACID Annual Meeting 2013. , 01.-02.10.2013, Rostock-Warnemünde, Germany . Kunz, K. L., Windisch, H., Knust, R. und Mark, F. C. (2013) Effects of ocean acidification and warming on growth and food consumption of juvenile Polar cod, Boreogadus saida. [Poster] In: BIOACID Annual Meeting 2013. , 01.-02.10.2013, Rostock-Warnemünde, Germany . Lange, J. A. F., Boersma, M. und Schwenk, K. (2013) Can mesozooplankton organisms adapt to the changed chemical composition and degradation in food quality caused by ocean acidification?. [Poster] In: BIOACID II Annual Meeting. , 01.-02.10.2013, Warnemünde, Germany . Pansch, A., Asmus, H., Asmus, R., Sokol, S. und Wahl, M. (2013) Multi-stressors and multi-community approaches in order to better predict future climate changes. [Poster] In: BIOACID II Annual Meeting 2013. , 01.-02.10.2013, Rostock-Warnemünde, Germany . Schade, H., Thomsen, J., Werner, F. J., Hassenrück, C. und Melzner, F. (2013) Vulnerability of marine ecosystems to ocean acidification under differential energy availability: a field study. [Poster] In: BIOACID Annual Meeting 2013. , 01.-02.10.2013, Rostock-Warnemünde, Germany . Schwichtenberg, F., Pätsch, J., Amann, T., Schartau, M. , Thomas, H., Winde, V., Dellwig, O., van Beusekom, J. E. E., Böttcher, M., Grashorn, S. und Salt, L. (2013) Impact of internal and external Alkalinity fluxes on the carbonate system in the German Bight / SE North Sea – A model study for the years 2001 – 2009. [Poster] In: EGU General Assembly 2013. , 07.-12.04.2013, Vienna, Austria . Sommer, U., Paul, C. und Moustaka-Gouni, M. (2013) Phytoplankton response to warming and CO2 increase during the first indoor mesococms experiment. [Poster] In: BIOACID Annual Meeting 2013. , 01.-02.10.2013, Rostock-Warnemünde, Germany . Werner, F. J. und Matthiessen, B. (2013) CO2 and temperature effects on Fucus-associated epiphytes. [Poster] In: BIOACID Annual Meeting 2013. , 01.-02.10.2013, Rostock-Warnemünde, Germany . Barkmann, W., Koeve, W. und Oschlies, A. (2012) Response of ocean carbon tracer distributions to prognostic particle sinking. [Poster] In: BIOACID II Kickoff-Meeting. , 06.-07.11.2012, Kiel, Germany . Büdenbender, J., Hildebrandt, N., Niehoff, B. und Riebesell, U. (2012) Ocean acidification effects on pteropod larval and adult stages at “in-situ” conditions during a mesocosm experiment. [Poster] In: 3. International Symposium on The Ocean in a high-CO2 World. , 24.-27.09.2012, Monterey, USA . Büscher, J. und Form, A. U. (2012) Ecophysiological responses of the cold-water coral Lophelia pertusa towards isolated and combined effects of climate change: current status and future approach. [Poster] In: BIOACID II Kickoff-Meeting. , 06.-07.11.2012, Kiel, Germany . Clemmesen, C. , Maneja, R., Frommel, A., Geffen, A. J., Folkvord, A. und Piatkowski, U. (2012) Size selective mortality in larval Atlantic cod, Gadus morhua L. in relation to ocean acidification revealed by otolith analysis. [Poster] In: 3. Symposium on the Ocean in a High-CO2 World. , 24.-27.09.2012, Monterey, USA . Endres, S. , Galgani, L. und Engel, A. (2012) Marine bacteria thrive when the ocean acidifies. [Poster] In: ISME14 - 14th International Symposium on Microbial Ecology. , 19.-24.08.2012, Copenhagen, Denmark . Fink, A., Lichtschlag, A. und de Beer, D. (2012) Biogeochemistry and habitat characterization of a CO2 enriched reef of Upa-Upasina (Milne Bay, Papua New Guinea). [Poster] In: BIOACID II Kickoff-Meeting. , 06.-07.11.2012, Kiel, Germany . Hildebrandt, N., Niehoff, B., Büdenbender, J. und Schulz, K. G. (2012) Zooplankton community development under elevated CO2 - Results from a mesocosm study. [Poster] In: 3. International Symposium on The Ocean in a high-CO2 World. , 24.-27.09.2012, Monterey, USA . Horn, H. G., Aberle, N., Löder, M. G. J. und Boersma, M. (2012) The role of microzooplankton under future ocean acidification and warming scenarios. [Poster] In: BIOACID II Kickoff-Meeting. , 06.-07.11.2012, Kiel, Germany . Landolfi, A. , Koeve, W. , Dietze, H. und Oschlies, A. (2012) The TP* Conveyor. [Poster] In: Ocean Sciences Meeting 2012 . , 20.-24.02.2012, Salt Lake City, USA . Maneja, R., Frommel, A., Browman, H. I., Geffen, A. J., Folkvord, A., Piatkowski, U. , Durif, C. M. F., Bjelland, R., Skiftesvik, A. B. und Clemmesen, C. (2012) Ocean acidification may cause otolith hypercalcification and changes in swimming behaviour in larval Atlantic cod, Gadus morhua L.. [Poster] In: BIOACID II Kickoff-Meeting. , 06.-07.11.2012, Kiel, Germany . Maneja, R., Frommel, A., Geffen, A. J., Folkvord, A., Piatkowski, U. und Clemmesen, C. (2012) Comparative study of ocean acidification effects on otolith growth of larval Atlantic cod (Gadus morhua L.) and Atlantic herring (Clupea harengus L.). [Poster] In: 3. Symposium on the Ocean in a High-CO2 World. , 24.-27.09.2012, Monterey, USA . Maneja, R., Hu, M. Y. A., Geffen, A. J., Melzner, F., Gutowska, M., Clemmesen, C. und Piatkowski, U. (2012) Elevated seawater pCO2 concentrations affect statolith morphology and prey capture ability in early life cuttlefish Sepia officinalis. [Poster] In: BIOACID II Kickoff-Meeting. , 06.-07.11.2012, Kiel, Germany . Maneja, R., Hu, M. Y. A., Geffen, A. J., Melzner, F., Gutowska, M., Clemmesen, C. und Piatkowski, U. (2012) Elevated seawater pCO2 concentrations affect statolith morphology and reduce prey capture ability in early life cuttlefish Sepia officinalis. [Poster] In: Cephalopod International Advisory Council Symposium. , 27.10.-02.11.2012, Florianopolis, Brazil . Maneja, R., Hu, M. Y. A., Geffen, A. J., Piatkowski, U. , Clemmesen, C. , Gutowska, M. und Melzner, F. (2012) Experimental studies on the impact of elevated seawater pCO2 concentration on statolith morphology and prey capture ability in early life cuttlefish, Sepia officinalis. [Poster] In: 3. Symposium on the Ocean in a High-CO2 World. , 24.-27.09.2012, Monterey, USA . Mark, F. C., Bock, C. H., Bridges, C. R., Claireaux, G., Clemmesen, C. , Frickenhaus, S., Held, C., Knust, R., Lannig, G., Lischka, S. , Lucassen, M., Niehoff, B., Storch, D., Piatkowski, U. , Pörtner, H. O. und Sartoris, F. J. (2012) Effects of ocean acidification in a warming climate on species interactions at distribution boundaries: mechanisms and consequences at ecosystem level. [Poster] In: 3. Symposium on the Ocean in a High-CO2 World. , 24.-27.09.2012, Monterey, USA . Mark, F. C., Bock, C. H., Bridges, C. R., Claireaux, G., Clemmesen, C. , Frickenhaus, S., Held, C., Knust, R., Lannig, G., Lischka, S. , Lucassen, M., Niehoff, B., Storch, D., Piatkowski, U. , Pörtner, H. O. und Sartoris, F. J. (2012) Effects of ocean acidification in a warming climate on species interactions at distribution boundaries: mechanisms and consequences at ecosystem level. [Poster] In: BIOACID II Kickoff-Meeting. , 06.-07.11.2012, Kiel, Germany . Frommel, A., Maneja, R., Michael, K., Geffen, A., Lowe, D., Malzahn, A., Geffen, A., Folkvord, A., Hermann, B., Piatkowski, U. , Lucassen, M. und Clemmesen, C. (2011) CO2D in the future. [Poster] In: 2. Annual Meeting of BIOACID. , 26.-30.09.2011, Bremen, Germany . Maneja, R., Piatkowski, U. und Melzner, F. (2011) Effects of ocean acidification on statolith calcification and prey capture in early life cuttlefish, Sepia officinalis. [Poster] In: EuroCeph 2011 Cephalopod Biology Research in the 21st Century – A European Perspective. , 07.-10.04.2011, Vico Equense, Italy ; p. 2011 . Journal of Shellfish Research, 30 (3). Schwichtenberg, F., Pätsch, J., Lorkowski, I., Schartau, M. , Thomas, H., Winde, V., Dellwig, O., van Beusekom, J. E. E. und Böttcher, M. (2011) Impact of alkalinity fluxes on the carbon cycle in the southern North Sea between 1977 and 2006. [Poster] In: AMEMR III. , 27.-30.06.2011, Plymouth, UK . Bögner, D., Bickmeyer, U. und Köhler, A. (2010) Studying the effects of Ocean Acidification on sea urchin eggs using planar patch clamp. [Poster] In: Joint EPOCA, BIOACID and UKOARP Meeting. , 27.09.-30.09.2010, Bremerhaven, Germany . Niehoff, B., Brodte, E., Hildebrandt, N., Klein, M., Knüppel, N. und Sartoris, F. J. (2010) Preliminary results from incubation experiments with boreal and Arctic copepod species. [Poster] In: Joint EPOCA, BIOACID and UKOARP Meeting. , 27.09.-30.09.2010, Bremerhaven, Germany . Schwichtenberg, F., Pätsch, J., Schartau, M. , Thomas, H., Winde, V., Schultz, M., Dellwig, O., van Beusekom, J. E. E., Liebezeit, G. und Böttcher, M. (2010) First approaches of carbonate dissolution on the shelf. [Poster] In: EPOCA, BIOACID, UKOARP Annual Meeting. , 27.09.-30.09.2010, Bremerhaven, Germany . Krishna, S. (2017) Model assessment and model-based data analyses of an ocean acidification mesocosm experiment. (Doktorarbeit/PhD), Christian-Albrechts-Universität Kiel, Kiel, Germany, 143 pp. Stiasny, M. H. (2017) Effects of Ocean Acidification on Atlantic Cod Larvae (Gadus morhua). (Doktorarbeit/PhD), Christian-Albrechts-Universität Kiel, Kiel, Germany, 99 pp. Al-Janabi, B. (2016) The adaptive potential of early life-stage Fucus vesiculosus under multifactorial environmental change. (Doktorarbeit/PhD), Christian-Albrechts-Universität Kiel, Kiel, Germany, 141 pp. Sander, N. (2015) Alterations in plankton community interactions under future ocean acidification conditions. (Masterarbeit), Universität Hamburg, Hamburg, Germany, 64 pp. Bögner, D. (2014) Ocean Acidification vs. Reproduction: What we have learned from the past and what we left for the future. (Doktorarbeit/PhD), Universität Bremen, Bremen, Germany, . pp. Schwichtenberg, F. (2013) Drivers of the carbonate system variability in the southern North Sea: River input, anaerobic alkalinity generation in the Wadden Sea and internal processes. (Doktorarbeit/PhD), Universität Hamburg, Hamburg, Germany, 160 pp. Hauck, J. (2012) Proceses in the Southern Ocean carbon cycle: Dissolution of carbonate sediments and inter-annual variability of carbon fluxes. (Doktorarbeit/PhD), Universität Bremen, Bremen, Germany, 127 pp. Dierking, J. (2013) Cruise Report R.V. Alkor AL 413. . GEOMAR Helmholtz-Zentrum für Ozeanforschung, Kiel, Germany, 19 pp. DOI 10.3289/CR_AL413. Riebesell, U. und Meyerhöfer, M. (2018) MBF Projekt BIOACID Phase III : Abschlussbericht : (1. Oktober 2015-30. November 2017). . GEOMAR, Kiel, Germany, 236 pp. Bach, L. T. , Böhm, F., Büscher, J., Clemmesen, C. , Ekardt, F., Gössling-Reisemann, S., Jakob, L., Königstein, S., Koeve, W. , Lischka, S. , Mark, F., Matthiessen, B., Mintenbeck, K., Ott, K., Pörtner, H. O., Riebesell, U. , Stiasny, M. , Storch, D., Voss, M., Wahl, M. und Werner, F. J. (2017) Dem Ozeanwandel auf der Spur: BIOACID - Biologische Auswirkungen von Ozeanversauerung. , ed. by Nicolai, M.. GEOMAR, Kiel, Germany, 23 pp. Bach, L. T. , Böhm, F., Büscher, J., Clemmesen, C. , Ekardt, F., Gössling-Reisemann, S., Jakob, L., Königstein, S., Koeve, W. , Lischka, S. , Mark, F., Matthiessen, B., Mintenbeck, K., Ott, K., Pörtner, H. O., Riebesell, U. , Stiasny, M. , Storch, D., Voss, M., Wahl, M. und Werner, F. J. (2017) Exploring Ocean Change: BIOACID - Biological Impacts of Ocean Acidification. , ed. by Nicolai, M.. GEOMAR, Kiel, Germany, 23 pp. Pondorfer, A. und Rehdanz, K. (2015) Eliciting preferences for public goods in non-monetized communities: Accounting for preference uncertainty. . Kiel Working Paper, 2010 . , 19 pp. Riebesell, U. und Meyerhöfer, M. (2015) MBF Projekt BIOACID Phase II : Abschlussbericht : (1. September 2012-30. September 2015). . GEOMAR, Kiel, Germany, 296 pp. Koenigstein, S. und Gößling-Reisemann, S. (2014) Ocean acidification and warming in the Norwegian and Barents Seas: impacts on marine ecosystems and human uses - Stakeholder consultation report. . University of Bremen, artec Sustainability Research Center, Bremen, Germany, 24 pp. DOI 10.5281/zenodo.8317. Broadgate, W., Riebesell, U. , Armstrong, C., Brewer, P., Denman, K., Feely, R., Gao, K., Gattuso, J. P., Isensee, K., Kleypas, J., Laffoley, D., Orr, J., Pörtner, H. O., de Rezende, C. E., Schmidt, D., Urban, E., Waite, A. und Valdes, L. and International Geosphere- Biosphere Programme (IGBP), Intergovernmental Oceanographic Commission of UNESCO (IOC), Scientific Committee on Oceanic Research (SCOR) (2013) Ocean Acidification: Summary for Policymakers. . IGBP, Stockholm, Sweden, 22 pp. Broadgate, W., Riebesell, U. , Armstrong, C., Brewer, P., Denman, K., Feely, R., Gao, K., Gattuso, J. P., Isensee, K., Kleypas, J., Laffoley, D., Orr, J., Pörtner, H. O., de Rezende, C. E., Schmidt, D., Urban, E., Waite, A. und Valdes, L. and International Geosphere- Biosphere Programme (IGBP), Intergovernmental Oceanographic Commission of UNESCO (IOC), Scientific Committee on Oceanic Research (SCOR) (2013) Ozeanversauerung: Zusammenfassung für Entscheidungsträger. . IGBP, Stockholm, Sweden, 22 pp. Laffoley, d. d., Baxter, J. M., Nicolai, M., Ohlendiek, U., Meyerhöfer, M. und Riebesell, U., eds. and Ocean Acidification Reference User Group, European Project on Ocean Acidification (EPOCA) (2012) Ozeanversauerung, was ist das? Auf den Punkt gebracht : ein aktueller Blick auf das globale Problem der Ozeanversauerung für alle, die mehr wissen wollen Eds. Laffoley, D. d'A., and Baxter, J. M. Übers. ins Deutsche: Maike Nicolai und Uta Ohlendiek, red. von Michael Meyerhöfer und Ulf Riebesell]. . Kieler Exzellenzcluster Ozean der Zukunft, Kiel, Germany, 23 pp. Riebesell, U. und Meyerhöfer, M. (2012) BMBF Projekt BIOACID - Biological Impacts of Ocean Acidification Phase I ; Abschlussbericht ; (01. August 2009 - 31. August 2012). . GEOMAR, Kiel, Germany, 296 pp. DOI 10.2314/GBV:769914888. Sswat, M. , Boxhammer, T. , Jutfelt, F., Clemmesen, C. und Riebesell, U. (2016) Performance of herring larvae in a simulated future ocean food web, using the "Kiel Off-Shore Mesocosms for future Ocean Simulations". DOI 10.3289/KOSMOS_HERRING_SWEDEN_2013. Sswat, M. (2015) Floating ice sheets hitting "Kiel Off-Shore Mesocosm for future Ocean Simulations" (KOSMOS) during the long-term study in Gullmar Fjord (Sweden) 2013. DOI 10.3289/KOSMOS_ICEDRIFT_SWEDEN_2013. Boxhammer, T. , Bach, L. T. , Czerny, J., Nicolai, M., Posman, K., Sswat, M. und Riebesell, U. (2015) Video of the sampling strategy to empty sediment traps of the “Kiel Off-Shore Mesocosms for future Ocean Simulations” (KOSMOS). DOI 10.3289/KOSMOS_SEDIMENT_TRAP_SAMPLING. Boxhammer, T. , Sswat, M. , Paul, A. J., Nicolai, M. und Riebesell, U. (2015) Video of a plankton community enclosed in a “Kiel Off-Shore Mesocosm for future Ocean Simulations” (KOSMOS) during a study in Tvärminne Storfjärden (Finland) 2012. DOI 10.3289/KOSMOS_PLANKTON_FINLAND_2012. Sswat, M. , Boxhammer, T. , Jutfelt, F., Bach, L. T. , Nicolai, M. und Riebesell, U. (2015) Video of a plankton community enclosed in a "Kiel Off-Shore Mesocosm for future Ocean Simulations" (KOSMOS) during the long-term study in Gullmar Fjord (Sweden) 2013. DOI 10.3289/KOSMOS_PLANKTON_SWEDEN_2013. Diese Liste wurde am Tue Apr 23 15:07:02 2019 CEST generiert.